To foster open, transparent, competitive, and financially sound markets; to avoid systemic risk; and to protect market users and their funds, consumers, and the public from fraud, manipulation, and abusive practices related to derivatives and other products that are subject to the Commodity Exchange Act. I am pleased to present the Strategic Plan of the Commodity Futures Trading Commission (CFTC) for fiscal years 2014 through 2018. The mission of the agency is vital: To protect market participants and the public from fraud, manipulation, abusive practices and systemic risk related to derivatives – both futures and swaps – and to foster transparent, open, competitive and financially sound markets. These markets are essential to enable farmers, ranchers, manufacturers, and other companies to manage risk effectively, and focus on what they do best – innovating, producing goods and services for the economy, and creating jobs. The passage of the Dodd-Frank Wall Street Reform and Consumer Protection Act in the wake of the 2008 financial crisis greatly expanded the agency’s responsibilities to include the regulation and oversight of the swaps market. Shortly thereafter, the agency developed a strategic plan to put the new framework in place. We have already made much progress:  The new regulatory framework is now substantially in place. Our challenge now is to make sure the markets serve their fundamental purpose by functioning openly, fairly, and efficiently. It is with this in mind that we have prepared our new Strategic Plan. The 38 performance goals are intended to help establish priorities and focus our efforts. The Plan takes account of the progress we have made and the work ahead as we continue implementing the reforms mandated by Congress and fulfilling our responsibilities under the Commodity Exchange Act. We will focus on transparency, access and market integrity – three touchstones of well working markets and all prerequisites to restoring the public trust that is essential to the success of our financial system. In the near term, our efforts will be directed at finishing the rule-writing and making sure the new rules achieve the goals Congress set. We will focus on our compliance and enforcement program, and invest in the technology necessary to support transparency and effective oversight of an increasingly sophisticated, automated market. Data standards, data reporting, and data management will be especially important. Regulatory coordination will be another key focus area. We will work with our domestic and international colleagues to reduce opportunities for potential regulatory arbitrage and ensure a competitive global market that serves the needs of participants. To make meaningful progress towards our goals, accountability is critical. Our strategic plan recognizes this. The CFTC will implement annual operational plans for each division, and hold senior staff accountable for performance results. The CFTC’s budget will also be important. Any organization’s ability to execute on its strategic plan is dependent on having sufficient resources. Current resource constraints may limit the agency’s ability to achieve all its goals, or the speed with which certain goals can be achieved. We are committed to doing all we can, and will continue to use the resources we have available in the most efficient and productive way possible. Without additional resources, however, our markets cannot be as well supervised; participants cannot be as well protected; market transparency and efficiency cannot be as fully achieved. Very few Americans participate directly in the derivatives markets. Yet these markets profoundly affect the prices we all pay for food, energy, and many other goods and services, and they create substantial benefits for American families. Appropriate rules and oversight are necessary ingredients to maintaining strong, transparent, and efficient markets. All of us at the CFTC will do all we can to meet the goals and objectives in this Strategic Plan. This document presents the Commodity Futures Trading Commission’s (CFTC) Strategic Plan for the period FY 2014 through FY 2018. It is prepared in accordance with the requirements of the Government Performance and Results Act Modernization Act (GPRAMA) of 2010 and Office of Management and Budget Circular A-11 Part 6, and presents the CFTC’s strategic goals, objectives, and strategies for achieving those goals, as well as perfor­mance goals for measuring success. Congress established the CFTC as an independent agency in 1974, after its predecessor operated within the U.S. Department of Agriculture (USDA). Its mandate was renewed and/or expanded in 1978, 1982, 1986, 1992, 1995, 2000, 2008, and 2010. The CFTC and its predecessor were established to protect market participants and the public from fraud, manipulation, and other abusive practices in the commodity futures and options markets. After the 2008 financial crises and the subsequent enactment of the Dodd-Frank Act, the CFTC’s mission expanded to include oversight of the swaps marketplace. The Commission administers the Commodity Exchange Act (CEA), 7 U.S.C. section 1, et seq. The CEA brought under federal regulation futures trading in all goods, articles, services, rights, and interests; commodity options trading; leverage trading in gold and silver bullion and coins; and otherwise strengthened the regulation of the commodity futures trading industry. It established a comprehensive regulatory structure to oversee the volatile futures trading complex. On July 21, 2010, President Obama signed the Dodd-Frank Act, which amended the CEA to establish a comprehensive new regulatory framework for swaps, as well as enhanced authorities over historically regulated entities. Title VII of the Dodd-Frank Act, which relates to swaps, was enacted to reduce systemic risk, increase transparency, and promote market integrity within the financial system. The U.S. futures and swaps markets are estimated at $30 trillion and $400 trillion, respectively. By any measure, the markets under CFTC’s regulatory purview are large and economically significant. Given the enormity of these markets and the critical role they play in facilitating price discovery and hedging of risk, ensuring that these markets are transparent, open, and competitive is essential to their proper functioning and to help safeguard the financial stability of the Nation. In the 2011 to 2015 Strategic Plan, the CFTC identified 54 performance measures (now termed performance goals) used to convey program effectiveness. These measures are currently collected and analyzed on a semi-annual basis and reported in the CFTC Annual Performance Report. In building the FY 2014 to FY 2018 Strategic Plan, the CFTC evaluated the effectiveness and usefulness of these previous measures in conveying program success. While the Commission believes that in aggregate, they provide an accurate portrayal of progress, the Commission saw the opportunity to improve in a couple key areas. First, performance goals are most useful when each division or office director is held accountable for these goals and strategies. Updating the goals twice a year meant that directors had little or no time to make course corrections if their programs were underperforming. Second, with the administration-wide push to develop outcome based measures, the CFTC had the opportunity to revise several output based measures to make them more informative. Finally, the Commission tied the performance goals to the broader strategic goals and objectives instead of individual strategies, which should be a better gauge of program success. A top down approach was used to build the FY 2014 to FY 2018 performance goals. The first priority was to analyze each strategic goal and strategic objective to isolate key variables that indicate whether progress is being made. This is an especially difficult task as many of the goals and objectives are abstract in nature (e.g., measuring the susceptibility of markets to manipulation and other abusive practices). Accordingly, the CFTC developed multiple performance goals per strategic goal and in some cases per strategic objective. When viewed together, the Commission believes they will display whether true progress is being made towards the goal. The result is 38 performance goals across the Commission, many of which are new goals. In FY 2014 and FY 2015, these will be baselined with targets established in the Annual Performance Plan (APP). The CFTC plans to monitor these goals on a quarterly basis, provide better and more frequent assessments of accomplishments to leadership, and provide division and office directors more time to make adjustments where warranted. The CFTC will seek greater accountability (see performance goal 5.1.a.) by developing annual operational plans. These operational plans tie the strategic goals and objectives with tactical requirements. The goals, objectives, and strategies will also be included in the annual performance evaluations of the office or division director or particular staff charged with implementing the goals, objectives, and strategies. Transparency and consistent application of both the statute and rules is an inherent obligation of the Commission. The market and its participants should understand clearly all Commission rules and requirements. Well-functioning markets require clear and consistent regulatory guidance and must operate according to the Commission approved rulebooks. It is also imperative that the Commission act in a timely manner to review and approve contracts, rulebooks, and applications so that SEFs, DCMs, SDRs, FBOTs, and DCOs may operate in an efficient and effective manner. Information technology (IT) is a key enabler at the CFTC and must provide highly available infrastructure and services, access to data, platforms for staff data analysis, and enterprise-focused automation services. With the Commission’s increased responsibilities, upgrades in technology will require input and collaboration across the Commission’s divisions to include well defined parameters, staffing and budgetary resources to enable cost-effective development and deployment of systems. Once operational, these systems can pay significant dividends for the Commission. Listed at the end of each strategic goal in this strategic plan are IT initiatives that support achieving the goal and its objectives. The 2014-2018 Information Technology Strategic Plan (ITSP) further describes the initiatives and how IT will be used to increase the effectiveness of CFTC regulatory mission and mission support activities. Mission Statement:  The mission statement is an enduring description of why the CFTC exists. While it may be refined throughout time, the underlying premises would not change without an accompanying change in the law. Strategic Goals:  Strategic goals articulate clear mission functions and operations of the Commission. The goals break down the mission into the major ideals the Commission is trying to achieve and distinguish the Commission’s mission from other agency missions. Like the mission statement, strategic goals are long term propositions. Strategic Objectives:  The strategic objectives bridge the gap between the broader strategic goals and the tactical strategies. The objectives provide the general pathway the agency will take to accomplish its strategic goals and should be measureable. Performance Goals:  Performance goals indicate the level of performance to be accomplished within a certain time period. They are generally linked to strategic objectives, but could also be aligned directly with the strategic goal. Where possible, quantifiable performance goals are used and preferred, but milestone related goals can be appropriate when quantifiable goals are not possible. Performance goals contain three parts: an indicator, a target, and a time period and should be monitored against a baseline. Strategies:  Strategies describe the tactical level of effort to further the strategic objectives and strategic goals. Strategies generally reflect efforts to be achieved in the one to five year range and should be the impetus for budget and other planning documents. Derivatives and Derivatives Markets:  For purposes of this plan, the term “derivatives” includes all futures, swaps and other products that are subject to CFTC jurisdiction under the CEA. Likewise, “derivatives markets” includes, but is not limited to, futures, swaps, and options on swaps markets. The CFTC Mission and Strategic Goals present an overview as well as details for the four Strategic Goals and Management Objectives. See below for information on each goal including objectives, performance goals, strategies, and information technology initiatives. The CFTC’s mission can be broken into three key themes (the Marketplace, Avoidance of Systemic Risk, and Market Users) that are supported by four strategic goals:  (1) Market Integrity and Transparency; (2) Financial Integrity and Avoidance of Systemic Risk; (3) Comprehensive Enforcement; and (4) Domestic and International Cooperation and Coordination. The foundation for accomplishing these strategic goals lies with management objectives focused towards achieving Commission-wide excellence. The focus of Market Integrity and Transparency is to recognize that derivatives markets provide a means for market users to offset price risks inherent in their businesses and to serve as a public price discovery mechanism. This means that markets should be free of fraud, manipulation, and other abusive practices; and users should be confident that they will not be victimized. Market integrity is supported by a strong self-regulatory framework overseen by substantial registration administration, product and rule analysis, a strong surveillance program, and comprehensive examination process. In addition, appropriate information relevant to the markets must be widely and publicly distributed and applicable rules and trading structures must be sound, effective, and accessible to participants. The focus of Financial Integrity and Avoidance of Systemic Risk is to strive to ensure that Commission-registered derivatives clearing organizations (DCOs), swap dealers (SDs), major swap participants (MSPs), and futures commission merchants (FCMs) have the financial resources, risk management systems and procedures, internal controls, customer protection systems, and other controls necessary to meet their obligations so as to minimize the risk that the financial difficulty of any of these registrants, or any of their customers has systemic implications. Through the goal of Comprehensive Enforcement, the CFTC enforces the CEA and Commission regulations, and works to promote awareness of and compliance with these laws. Enforcement strives to expeditiously assess tips, complaints, and referrals regarding suspicious activities and potential violations; rigorously and thoroughly investigate such alleged wrongdoings; and effectively prosecute violations and seek imposition of appropriate sanctions. Domestic and International Cooperation and Coordination focuses on how the Commission interacts with domestic and international regulatory authorities, market participants, and others affected by the Commission’s regulatory policies and practices. Through domestic and international cooperation and coordination, the Commission is able to identify regulatory concerns, to develop solutions, and to address activities that cut across the jurisdiction of multiple authorities. The Commission’s cooperative work promotes internationally accepted standards of best practice, enhanced global regulatory practices, and robust enforcement efforts. To advance its mission goals and objectives, the CFTC will achieve Commission-wide excellence by empowering strong, enterprise-focused leaders, maintaining a high-performing and engaged workforce, and ensuring effective stewardship of resources. The CFTC will build and maintain a high-performing, diverse and engaged workforce through implementing innovative recruitment and retention programs, promoting transparent and clear communication, and developing and equipping leaders at all levels of the organization. The CFTC will also achieve Commission-wide excellence by managing resources effectively. The Commission will expand internal controls, governance, and planning processes and ensure that staff has the knowledge, data and technology, and other tools to work effectively. Derivatives markets are designed to provide a means for market users to offset price risks inherent in their businesses and to serve as a public price discovery platform from which prices are broadly disseminated for public use. For derivatives markets to fulfill their role in the national and global economy, they must operate efficiently and fairly, and serve the needs of market users. The markets best fulfill this role when they are open, competitive, and free from fraud, manipulation, and other abuses such that the prices discovered on the markets reflect the forces of supply and demand. The Commission strives for market efficiency, fairness, and transparency through the combined use of the following strategies:  (1) Applying a robust application process for entities to obtain Commission designation or registration; (2) evaluation of new contracts and rules and changes to contracts and rules to confirm compliance with the law; (3) continual surveillance of trading activity in the futures and swaps markets; (4) examination of regulated exchanges and swap execution facilities to verify that they are fulfilling their self-regulatory obligations; and (5) adoption of policies and strategies to promote market transparency. In the application process, an entity’s application must demonstrate that it is, and will continue to be, in compliance with the statutory core principles of the CEA and the Commission’s regulations. Once registered, the entity’s new products and rule submissions are subject to review and/or approval. Staff reviews new rules and rule changes adopted by exchanges for compliance with the statutory core principles of the CEA and the CFTC’s regulations. The Commission also reviews and/or approves newly listed contracts for compliance with applicable core principles including, in particular, core principles concerning susceptibility to manipulation and speculative position limits. Once rules and contracts are in place and trading begins, the Commission monitors such trading and the positions of market participants. This market and trade practice surveillance function screens for potential market manipulations and disruptive trading practices, as well as trade practice violations such as wash trading, prearranged trading, accommodation trading, customer fraud, fictitious sales, trading ahead, and trading against customer orders. Staff also evaluates changing market conditions and developments, such as shifting patterns of commercial or speculative trading, or the introduction of new trading activities, such as index trading or high frequency and algorithmic trading to assess possible market impacts. The Commission conducts regular Rule Enforcement Reviews (RERs) and System Safeguards Examinations (SSEs) to assess ongoing compliance by the exchanges with core principles through the self-regulatory programs operated by exchanges. This function represents a significant part of the regulatory oversight structure and serves to assess the soundness of the self-regulation program of the derivatives industry. In conducting RERs, Commission staff examines trading and compliance activities at the exchange that are in question. In conducting SSEs, staff review exchange controls and procedures for minimizing operational risk, maintaining reliable, secure, and adequate automated systems, and maintaining appropriate business continuity-disaster recovery plans and testing. These examinations evaluate exchanges’ programs of system safeguards and specific categories of risk analysis and oversight, including cyber and information security. Although Swap Data Repositories (SDRs) are not Self-Regulatory Organizations (SROs), they are subject to similar regulations as exchanges with respect to system safeguards and therefore are subject to SSEs. RER reports are made available to the public and posted on www.cftc.gov. Due to the sensitive nature of their subject matter and the need to protect exchanges and SDRs from cyber security intrusions, SSE reports are confidential and non-public. The CFTC is committed to transparency in the marketplace, and has a long history of publishing analytical reports and summaries of market activity. In addition, the staff conducts economic research and analyses of the markets to foster a better understanding of how the markets are functioning and to better inform the Commission and the public with respect to policy issues. The most well-known of these reports is the Commitments of Traders report. This weekly report provides a breakdown of each Tuesday’s open interest for selected futures and options markets. The Commission also produces an index investment data report, summarizing index investment activity in commodity markets, a Bank Participation in futures and options report, and a Cotton On-Call report. As the Commission gathers and analyzes the swap data that is now being reported to SDRs, the Commission anticipates the development of new reports designed to enhance the transparency of those markets that are able to draw on automated systems to assemble the necessary data for these reports. Derivatives markets serve an important function in the U.S. economy by providing a mechanism for price discovery and a means of offsetting price risk. It is important that the markets and the contracts traded on them are structured and overseen in a manner such that prices accurately reflect the economic forces of supply and demand. Keys to achieving this goal are effective exchange rules and well-designed contracts to provide the base for sound price discovery and effective risk management, as well as active monitoring of the behavior of market participants in all trading in the related markets including both the underlying and referenced derivatives. Indicator:  Strive for percentage of high impact contract and rule submissions received by the Commission through the OPERA portal. Target:  Baseline in years 1-2 and set targets annually. Description: Use of the OPERA portal will reduce staff burdens and increase the efficiency and effectiveness with which staff can strive to identify high impact contract and rule submissions in order to conduct reviews of new or amended contracts and rule filings. Through the portal, exchanges will be able to electronically file submissions directly with the Commission. The portal will then automatically route submissions to relevant staff without the need for staff to input certain data elements into its systems. This metric captures the efficiency with which staff can receive and process exchange submissions related to contracts and rules. Indicator:  Strive to strengthen capacity to receive and expeditiously evaluate all trading data and associated information to identify potential violations of the CEA or Commission regulations and the timely response to market emergencies. Target:  Baseline in years 1-2 and set targets in years 3-5. Description: Surveillance staff routinely makes referrals to Enforcement regarding suspected violations of CEA or Commission regulations with respect to manipulation, trade practice abuses and other suspect violations of the CEA and Commission regulations. Commission staff will strive to promptly assess market events giving rise to a market emergency in order to provide and implement timely recommendations. A key principle of a sound derivatives market regulatory structure is self-regulation by exchanges over their marketplaces. In this respect, exchanges are expected to have effective rules and procedures in place to protect the price discovery and risk shifting functions of the market as well as the interests of those trading in the markets. Moreover, it is the obligation of the exchanges to enforce these rules in a fair, equitable, and consistent manner. Exchanges are also expected to minimize sources of operational risk, and expected to maintain and test reliable, secure, and adequate automated systems and business continuity-disaster recovery plans and resources. Additionally, an exchange’s program of system safeguards must address specific categories of risk analysis and oversight, including information and cyber security. Although SDRs are not SROs, they are required by Commission regulation to have system safeguard programs similar to exchange programs. Under effective self-regulation and Commission oversight, market participants can trade knowing that they will not be taken advantage of, and the public can have confidence in the integrity of regulated markets. The Commission strives to maintain a three tiered program of regulatory oversight. At the outset, the Commission operates a designation process that reviews the overall capability of new exchanges to operate a viable marketplace with proper rules and procedures. A similar registration process is conducted for SDRs, and among other things, reviews the SDR applicant’s system safeguards program. On an ongoing basis, new rules and amendments to existing rules are reviewed by Commission staff to verify that they meet the core principles applicable to Designated Contract Markets (DCMs) and Swap Execution Facilities (SEFs), and SDRs under the CEA. Additionally, exchanges are required to provide timely notice to the Commission of all electronic trading halts and malfunctions, cyber security incidents or threats, activation of business continuity-disaster recovery plans, and planned changes to automated systems that may impact the reliability, security, or adequate scalable capacity of systems. SDRs are also required to provide similar notices. On an ongoing basis, Commission staff review these notifications and track status of changes and issues in order to evaluate the stability, capacity, resilience, security controls, and management of automated systems. Finally, the Commission maintains a review program that conducts examinations of exchanges’ self-regulatory programs, including system safeguards, on an ongoing basis to assess their continuing compliance with applicable core principles under the CEA and Commission regulations as well as the enforcement of their own rules. Systems Safeguard Examinations (SSEs) are also conducted for SDRs. Indicator:  Strive to examine compliance by exchanges with the CEA Core Principles and Commission regulations, prioritizing systemically important entities. Description: Utilizing both risk-based and Core Principles-based approaches, strive to conduct comprehensive examinations of selected compliance programs at the exchange and swap data repositories, and publish examinations reports when deficiencies are identified. Exchanges are notified, and staff monitors their remediation efforts. Indicator:  Strive to review exchange and SDR notifications and periodic status updates regarding significant systems disruptions and material planned changes to mission-critical systems or programs of risk analysis and oversight. Description: Review exchange and SDR notifications and periodic status updates regarding significant systems disruptions and material planned changes to mission-critical systems or programs of risk analysis and oversight, for analyst-level determination of need for further DMO review or further action. Indicator:  Strive to examine compliance by exchanges and SDRs with the system safeguards and cyber security requirements of the CEA Core Principles and Commission regulations, prioritizing systemically important entities. Description: Utilizing both risk-based and Core Principles-based approaches, strive to conduct comprehensive examinations of system safeguards and cyber security programs at exchanges and SDRs, and prepare examinations reports when deficiencies are identified. Exchanges and SDRs are notified, and staff monitors their remediation efforts. The term transparency can refer to various levels of information availability in a market. In a narrow sense it refers to the ability of traders to observe order flow on an exchange; that is, to see information such as the size and direction of orders, or the timing of orders. However, transparency can more broadly describe the availability of information pertaining to the reporting of price and volume of trading on an exchange and to the composition of participants involved in trading. Such information is important to both direct participants on the exchange, and more broadly to other individuals or businesses that use market information to make business decisions, even though they do not directly transact on the exchange. Market transparency also allows for assessments by market participants and regulators as to whether markets are functioning properly, and the overall robustness of the market. With the passage of the Dodd-Frank Act, the Commission now has a responsibility to oversee trading in the swaps markets. Part of this responsibility includes assuring that certain trading activity and information produced in these markets is reported, not only to regulators, but generally to the public on a real-time basis. The Dodd-Frank Act also requires publication, by the Commission, of semi-annual reports summarizing activity in the swaps markets. To fulfill this obligation, and generally assure that the derivatives markets are transparent, the Commission will initiate several strategies to update its current public transparency efforts as well as to launch new transparency efforts with respect to the swaps market. Indicator:  Percentage of derivatives activity covered by regularly published Commission reports. Description: In addition to regular reports on activity in the futures and options on futures markets, the Commission plans to begin publishing regular reports of activity in the swaps market to bring greater public transparency to this market. Initially such reports will cover the major swap categories and then be expanded to include other categories as they meet minimum activity thresholds. This metric provides a measure of public transparency into derivatives market activity for those markets where minimum activity and participation levels have been attained. Indicator:  Publish economic research reports to inform the public about market structure of the derivatives markets. Target:  3-4 reports per year. Description: These reports will be based on empirical research into the market microstructure of futures, options on futures, and swaps markets. The metric provides a measure of economic analyses designed to inform both the public and the academic community of various developments in these markets, including their ongoing evolution within the context of electronic trading technologies and regulations. An important goal of the Dodd-Frank Act was to create a data environment that allows the Commission to obtain a more complete view of traders’ positions and activity across derivatives markets. As a means to meet this goal, SDRs began receiving reports from swaps markets participants on the swap positions into which they have entered. These reports are a new stream of data available to the Commission that will bring greater transparency to daily activity in the swaps markets. As the data reporting to SDRs is enhanced through reporting compliance and data harmonization, staff will, in coordination with industry, work to integrate swaps information with information currently held in the Commission’s futures and options database. In so doing, staff will be better able to track the positions and activity of traders for the purpose of risk analysis, enforcing position limits, and market surveillance. Indicator:  Percentage of derivatives for which trader data can be matched across CFTC datasets. Description: For purposes of increasing market transparency, it is critical for staff to be able to match the position and trading activity across the major databases used by the Commission—e.g., large trader positions, futures and options on futures transactions, and swap market transactions. Being able to match these records not only allows Commission staff to see a more complete summary of traders’ activities, but allows staff to produce more comprehensive market reports and conduct more in-depth studies of market activity. This metric serves as a measure of regulatory and public transparency into trader derivative activity. Review derivatives contract terms and conditions more efficiently and effectively. Description:  Appropriate contract design is critical to diminishing the susceptibility of a contract to manipulation. Staff will continue to prioritize and analyze in a timely manner the terms and conditions of contracts to verify that contracts self-certified by DCMs and SEFs are well-designed and that they meet the core principles of the CEA and Commission regulations. To improve the allocation of Commission resources, staff plans to increase automation of the submission process by implementing the OPERA portal, allowing exchanges to submit certification information and supporting documents electronically to the Commission. Develop and implement technology based surveillance tools to keep pace with market technology. Description:  The Commission’s surveillance program monitors the futures, options, and swaps market activity including those traders whose positions are large enough to potentially impact the orderly market operations. When warranted, Commission staff contacts traders and works with exchange surveillance staff to defuse potentially disruptive situations in futures markets. Another key objective of the Commission is to assess whether participants within the markets are protected against fraudulent or abusive trading practices. To detect these types of abuses Commission staff routinely reviews trading activity of individuals at each domestic exchange, and with respect to transactions reported to SDRs. With the assistance of computer aided tools such as graphics and visualization software or automated detection models, staff looks for patterns of activity that may indicate possible violations of the CEA by one or more individuals. When such patterns are observed, staff engages in additional efforts to collect supporting documents and other evidence of violations. Where appropriate, matters are referred to the appropriate exchange and/or the Division of Enforcement for continued investigation, disciplinary action, or enforcement action. In addition, Commission staff routinely consults with surveillance staff at exchanges and SDRs as a means to collect additional information and intelligence on surveillance matters as well as to coordinate actions involving traders when appropriate. As the markets and trading strategies continue to evolve, staff will make use of newly available technologies to blend data from different data sources, such as futures and swaps position data, trade execution data and order data, and develop new methods to analyze trading within and across products and markets. Analysis of DCM, SEF, and Foreign Boards of Trade (FBOT) registration applications and the ongoing oversight of DCMs, SEFs, and FBOTs. Description:  A key element for DCMs and SEFs to operate in a transparent, competitive, and fair manner is that they have a set of rules in place that govern the operation of markets and the rights and obligations of market participants. Before a DCM or SEF may begin operation, staff conducts a review of its proposed rules to verify that the rules comply with applicable core principles. Staff also makes an assessment of the ability of the applicant to enforce its rules on an ongoing basis. In addition, staff reviews registration applications for FBOTs to assess the extent to which they are subject to comprehensive supervision and regulation by the appropriate governmental authority in their home country that is comparable to the comprehensive supervision and regulation to which DCMs are subject under CEA, Commission regulations, and other applicable U.S. laws and regulations. On an ongoing basis, staff reviews rules and rule changes for compliance with core principles as a means to verify that DCMs and SEFs are operating in a fashion that protects the markets and market users from abuse and price distortions. Review of SDR applications and the ongoing supervision of SDRs. Description:  The Dodd-Frank Act created a new category of registrant, the Swap Data Repository. The purpose of these entities is to provide a central facility for swap data reporting and recordkeeping. As with DCMs and SEFs, SDRs are required to register with the Commission and comply with applicable core principles in CEA. On an ongoing basis, staff will review the rules and rule changes of SDRs for compliance with core principles as a means to verify that SDRs are operating in a fashion that protects markets and market users, and provides the Commission with the necessary access to the swaps data required to fulfill its mission. Develop consistent reporting of relevant swaps data. Description:  The Dodd-Frank Act and various Commission regulations have imposed transactions and positions reporting requirements on various market participants and other regulated entities, as well as resulted in the creation of new infrastructure in the form of SDRs. In an effort to ensure that the data reported to, and disseminated by SDRs, is meaningful to the Commission, staff, and market participants, the Commission and staff has ongoing consultations with a broad spectrum of market participants on all aspects of the reporting process. This effort is in addition to any regulatory actions including potential rule changes contemplated in other strategies above. Given the fact that this information is relevant to other regulatory agencies in the United States, the Commission is collaborating with such agencies including the Office of Financial Research to develop new data standards. Reflecting the global nature of the swaps markets, the Commission is also collaborating with regulators in other jurisdictions as well as international bodies like the Financial Stability Board to harmonize data standards so as to facilitate aggregation of swaps data reported to data repositories operating in such jurisdictions. Develop regular RERs of SEFs and SDRs. Description:  The regulatory model of U.S. derivatives markets is a self-regulatory one where exchanges are required to adopt and enforce rules designed to protect markets as well as participants in those markets. To assess whether these exchanges are enforcing these rules on an ongoing basis, the CFTC conducts periodic reviews of the exchange programs put in place to verify compliance with the core principles of the Act. The creation of the SEF as a new category of exchanges will require staff to extend the RER process to the SEF category. In addition, the creation of the SDR as a new category will similarly require the development of an RER process suitable to that category. Staff will rely on its experience in conducting DCM reviews along with information obtained from the SEF approval process to develop its RER process for SEFs and SDRs. Publish Interactive Reports on Swap Market Activity. Description:  A key goal of the Dodd-Frank Act was to create greater transparency in the swaps markets. This is to be accomplished by bringing the trading of standardized swaps onto exchanges and to have information on all swaps reported to swaps data repositories. Beginning in 2013, information on individual swaps transactions will be reported to swaps data repositories. To reach the goal of making swap market activity more transparent to the public, the CFTC will continue to analyze the swap data being reported to SDRs to refine its reports that capture and summarize this activity. Conduct economic analysis and research on market structure and transparency for derivatives. Description:  A goal of the Dodd-Frank Act is to achieve pre-trade transparency for the swaps traded on SEFs. Commission rules require that DCMs offer open and competitive centralized market trading for futures and swaps. To assess compliance with these regulations, staff will gather and analyze trade and order book data from SEFs and DCMs. While trade data from DCMs is being reported to the Commission, staff will work with DCMs to collate order book data, develop a database to store this data or alternatively, access data from DCMs on an as-needed basis, and develop tools to analyze this data and integrate it with trade data. Similarly, staff will work with SEFs to develop data standards and protocols to collate both trade and order book data, and develop tools to analyze this data. It will also collaborate with market structure experts from academia to strengthen its analytical capabilities and verify that the state of the art in terms of models and econometric techniques is being deployed. The efforts of such rigorous economic analysis will generate internal staff reports to inform the Commission, cost and benefit considerations to support Commission rulemaking, and research papers targeting publication in academic and practitioner journals. Receiving data electronically and automating its distribution throughout the Commission using business process automation software will improve productivity through streamlined registrations and reviews. Improving data quality in registration and product review submissions will allow staff to conduct registrations and reviews more efficiently and provide additional integration with ongoing surveillance activities. Building out proof of concept programs by surveillance staff will increase the ability to adjust surveillance efforts to evolving markets. Ingesting of order book data from reporting entities will allow surveillance staff to increase the depth of surveillance. Providing access to an increasing number of data sources and increasing sample sizes of market data (including non-futures market data) will allow surveillance staff to broaden the scope of surveillance. Enhancing data management tools and procedures will support an increasing number of special data calls related to surveillance activity and improve the ability to identify cross-market activities. Enhancing data management tools and procedures will support secure collaborative research. Continuously enhancing case management and monitoring systems will address structural market changes and increase integration between registration and review, surveillance, examination, and enforcement activities. Implementing a research-focused data environment will support CFTC and inter-agency research into evolving market conditions. Implementing the president’s digital government strategy to enhance the usability and mobility of reports published on CFTC.gov will support increased transparency of futures and swaps. In order to promote financially sound markets and to avoid systemic risk, the Commission’s main priorities are:  (1) To take all actions that it can to reduce the risk of disruptions to clearing and settlement systems for cleared transactions; (2) take all actions that it can to protect the funds that customers and swap counterparties entrust to SDs, FCMs, and other intermediaries; and (3) to provide compliance guidance and oversight to promote implementation of best practices for governance, risk management, business conduct and internal controls by registered DCOs, SDs, MSPs, and FCMs. As a central counter party, a DCO is required to have adequate financial, operational, and managerial resources to discharge its responsibilities and the ability to manage the risks associated with discharging its responsibilities through the use of appropriate tools and procedures. DCOs have flexibility in establishing these responsibilities. Because of this flexibility and the unique processes each DCO has in the place, the Commission has established regulations and a comprehensive program for evaluating DCOs for compliance with these regulations and statutory core principles. The Commission’s program for evaluating DCOs and their clearing members includes:  (1) The review of applications for DCO registration for evaluation of compliance with CEA’s core principles for DCOs and relevant Commission regulations; (2) the evaluation of DCO clearing participants for compliance with Commission regulations regarding clearing member risk management; (3) the evaluation of sufficiency of product and portfolio margin requirements; (4) the development of techniques to estimate and aggregate different types of risk across all DCOs and clearing members; (5) conduct DCO examinations, including the annual examination of DCOs that have been designated as systemically important by the Financial Stability Oversight Council (FSOC), to determine compliance with the CEA and relevant Commission regulations; and (6) review notifications submitted by DCOs, including but not limited to, activation of business continuity-disaster recovery plans, any systems incidents that may impair the DCOs automated system and the default of a clearing member. Commission staff reviews these notifications to evaluate the impact on the DCO’s financial and operational resources, and to monitor the DCO’s response. The Commission reviews the financial risks that the DCOs’ risk management procedures address and the financial risks that the DCOs’ financial resources cover. The Commission will evaluate the possible financial risk that, in an extreme market condition, a clearing firm may not have the financial resources to make a variation or initial margin payment. The Commission will determine what risk management processes the DCO has in place to address this financial risk (e.g., stress testing, daily risk management, and communication with settlement banks). The Commission also will evaluate the possible financial risk that, in the event of a default, the defaulting firm does not have sufficient margin on deposit to cover the default. Sufficient margin is important because generally it is the first financial resource used by the DCO to cure the default. To evaluate this risk, the Commission will review the DCO’s process for setting margin levels, review whether margin levels are sufficient to cover the appropriate liquidation period, and review the types of margin the DCO will accept. DCOs, FCMs, and other clearing participants are integral to the operation of sound clearing and settlement systems because their financial well-being mitigates the possibility of systemic risk that may arise as a result of financial difficulties that may be experienced by market participants during stressful market conditions. In addition, effective business conduct regulation and oversight will ensure that best practices are implemented by these registrants for managing the various forms of risk that arise in cleared and bilateral transactions. SDs, MSPs, FCMs, and other market intermediaries provide critical market services to participants in the derivatives markets. Congress recognized the need for oversight of the swap activities of SDs and MSPs when it adopted the Dodd-Frank Act, and gave that responsibility primarily to the Commission. Additionally, FCMs have increased complexity and risk over the years and our new customer protection rules now require FCMs to ensure proper risk management, internal controls and procedures are in place to mitigate these risks. Without appropriate risk management, business conduct standards, capital and margin levels, internal controls, and segregation arrangements, SDs, MSPs, and FCMs could fail to meet their financial obligations or fail to properly protect customer funds. Such failures can materially impact the financial wellbeing of their counterparties and customers. The “knock on” effect of these impacts could negatively impact other market participants given the interconnectedness of the financial system. The CEA and the Commission’s regulations establish a system of registration and oversight to address these requirements for protecting the derivatives markets. The Commission’s registration and compliance oversight of SDs, MSPs, and market intermediaries will monitor the compliance activities of these registrants and seek to provide timely oversight and guidance for complying with the system of registration and compliance established by the CEA and the Commission’s regulations. These activities will be undertaken both directly by the Commission and through oversight of the self-regulatory organizations to which the Commission has delegated authority. In this regard, the Commission will review required reports from registrants, address inquiries for formal and informal interpretative guidance and address self-reported compliance failures. The Commission will also evaluate the effectiveness of governance and internal oversight within the registrants through targeted reviews and examinations, oversight of examinations by SROs and a focus on the activities of the risk managers and chief compliance officers (CCOs) in the registrants. These activities will not only seek to improve governance and internal oversight practices in accordance with the Commission’s regulations, but to also shape these activities and encourage the adoption of best practices by our registrants. Finally, the Commission will review whether SDs, MSPs, and FCMs maintain sufficient financial resources, risk management procedures, internal controls, and customer protection practices to improve the financial stability of market participants and transparency in the markets. This objective will be accomplished through examinations of internal controls; reviews of a firm’s risk management processes and controls; evaluation of SDs capital and margin; and monitoring of the timeliness and accuracy of various required activities of the registrants such as trade confirmation and reporting, execution of swap trading relationship documentation, and portfolio reconciliation and compression. Each DCO maintains an initial margin model for the asset classes that it offers for clearing. The initial margin model is used to determine initial margin requirements that each clearing firm (or the clearing firm’s customers) must provide to the DCO. Typically, the initial margin requirements are calculated at the clearing firm level, as well as the individual customer account level. Under Commission regulations, initial margin requirements should be sufficient to cover the historical one-day or five-day price moves depending on the asset class of the product that the DCO offers for clearing. Generally speaking, the initial margin requirements for futures products are calculated at the product level, while the initial margin requirements for swaps are calculated at the portfolio level. The Commission will have to expand its program for reviewing futures and swaps initial margin models to determine DCO compliance and to monitor for adequate collateralization of risk within the clearing system. Additionally, the Commission will develop a program to compare initial margin requirements for similar, or the same, products that are cleared at more than one DCO. These programs will be administered by a margin model assessment group within the Commission. With the additional oversight of several new DCOs, and in order to evaluate financial integrity and system-wide risk, the Commission has to develop a program to monitor variation and initial margin requirements across DCOs. The program will have a goal of determining the aggregate variation margin payment a firm may have to make if all of its largest variation margin payments were to occur on the same day. The program also will have a goal of analyzing trends in initial margin requirements in order to anticipate possible problems for market participants that will have to produce collateral acceptable to DCOs. This will require the monitoring of DCO clearing participants with regard to specific, liquid resources available to such participants having to meet large variation margin payments and increased initial margin requirements. Recognizing that each DCO’s view of risk is limited to market participants clearing at that DCO and that many market participants will have positions at multiple DCOs and in more than one asset class, the Commission is the only financial regulator that will have the authority to aggregate and evaluate risk across all DCOs. The Commission is seeking to enhance its existing futures-specific risk surveillance program by developing procedures to stress test positions in swaps. Additionally, the Commission is seeking to develop a system that allows for the identification and then aggregation of related market participants across DCOs. By developing the tools to evaluate risk in this manner, the Commission seeks to be in a position to evaluate risks posed to the DCO and its clearing participants, as well as measure available financial resources and evaluate a DCO’s risk program proactively. The Commission conducts risk based examinations to assess ongoing compliance by the DCO with core principles and the implementing regulations. The scope of the examination includes analysis and sample testing of the DCO’s policies, procedures, rules, and systems concerning its financial, managerial, and operational activities, including a review of the resources and capabilities available at the DCO to monitor and control its risks and the safety and soundness of the DCO. DCO’s are required to minimize sources of operational risk through the development of automated systems that are reliable, secure, and have adequate scalable capacity and also develop business continuity-disaster recovery plans and resources. Additionally, a DCO’s program of system safeguards must address specific categories of risk analysis and oversight, including information and cyber security. The DCO must test to ensure the operational resources are adequate to ensure daily processing, clearing, and settlement. Indicator:  CFTC strives to conduct back testing of DCOs’ material product and portfolio initial margin requirements to assess their sufficiency. Description: The defaulting firm’s margin contributions are the first financial resource used to cover the financial impact of a clearing member default. To the extent margin can cover the financial impact of the default, the DCO will not have to use its own resources to cover the balance. To measure the sufficiency of margin requirements, the Commission will strive to back test the profit or loss of a given product or portfolio against the margin requirement for the applicable liquidation period. Indicator:  Clearing members’ ability to fund variation and initial margin requirements calculated in hypothetical CFTC-designed market scenarios. Target:  Strive to assess 70% of clearing members. Description: Failing to make a variation margin payment is one of the ways in which a firm can default to the DCO. Firm variation margin payments likely will increase as more swaps are cleared. The Commission is gathering information as to the type and level of financial resources available to clearing members to meet variation margin payments. The Commission’s objective is to enhance existing programs to evaluate aggregate clearing member financial resources against possible calls for variation payments at all DCOs in which a firm is a clearing member. Indicator:  Strive to aggregate cleared swaps, futures, and options positions into a comprehensive risk surveillance process and conduct analysis for each material market participant. Description: The Commission has a comprehensive program in place to aggregate and conduct risk surveillance of market participants’ futures and options positions. The Commission is developing procedures to aggregate swap positions across multiple DCOs and the asset classes for which such DCOs offer clearing services. Upon the development of such procedures, the Commission will be in a position to aggregate the risk of market participants that trade futures, swaps, and options and conduct risk surveillance for that aggregate portfolio. Indicator:  Strive to review DCO notifications regarding systems disruptions, material planned changes to mission-critical systems or programs of risk analysis and any other notifications that potentially impact the DCOs ability to process, clear and risk manage its business activities. Target:  Strive to conduct high-level review within 30-days of receipt and within 2-5 business days for significant disruptions. Description: The objective is to review DCO notifications regarding any hardware or software malfunction, cyber security incident, or targeted threat that materially impairs, or creates a significant likelihood of material impairment, of automated system operation, reliability, security, or capacity; any activation of the DCO’s BC/DR plan, and, material planned changes to DCO’s automated systems that are likely to have a significant impact on the reliability, security, or adequate scalable capacity of such systems, or programs of risk analysis and oversight. These reviews will be designed to evaluate the adequacy of the proposed corrective action to address systems disruptions and review plans for changes to systems or programs of risk analysis. Indicator:  Strive to examine compliance by DCOs with the Core Principles, including system safeguards and cyber security requirements, of the CEA and Commission regulations, prioritizing systemically important entities. Target:  Examine systemically important DCOs at least annually as required under Section 807(a) of Title VIII of the Dodd-Frank Act and strive to examine all other DCOs once every 3 years. Description: Strive to conduct comprehensive risk based examinations of DCOs regarding compliance with the Core Principles of the CEA and Commission regulations. Identify issues that may impact the DCOs ability to control and monitor its risks, present the issues to DCO management and monitor remediation efforts to rectify the issues. With the ongoing oversight of Commission registrants and the recent addition of swap market regulation and new futures customer protection rules, there is a critical need to provide SDs, MSPs, FCMs, and other market intermediaries with timely guidance with regard to the regulations. Such guidance is needed to help ensure the regulations are properly interpreted and implemented by these market participants on an ongoing basis and to encourage best practices by our registrants. This is particularly true over the period covered by this strategic plan during which time the new Dodd-Frank Act and customer protection regulations are implemented. Guidance can take a variety of forms:  (1) Staff input on registration applications; (2) staff no action and interpretative letters or responses to frequently asked questions; (3) staff feedback during examinations; (4) addressing self-reported compliance issues; and (5) ongoing regular contact with registrants and industry groups. Ongoing interpretive work for registering and overseeing swap dealers, major swap participants, and market intermediaries associated with the derivatives markets will serve to help guide these registrants in implementing best practices in line with the regulations adopted by the Commission under the Dodd-Frank Act. These efforts will include ongoing guidance on the implementation of new regulations, including customer protection rules, business conduct standards, sales practices, swaps disclosure, risk governance and management, recordkeeping and reporting for swaps, and guidance to new Commodity Pool Operators (CPOs), Commodity Trading Advisors (CTAs), and Introducing Brokers (IBs). Indicator:  Number of SD, MSP, and FCM annual and quarterly reports reviewed and feedback provided; percent of swap dealer and major swap participant’s registration documentation completed. Target:  Review and provide feedback on 50% of registrant annual and quarterly reports received; provide feedback to NFA on registration applications such that NFA can complete registration of all provisionally registered SDs and MSPs; routinely respond to 90% of inquiries for guidance in a timely manner dependent on the nature of the inquiry. Description: The Commission, working with the DSROs, will review annual and periodic reports from SDs, MSPs, and FCMs and provide oversight guidance to registrants through examinations, issuance of guidance and no action letters, and other communications such as round tables as appropriate. Sample review registration documentation and provide guidance in the form of feedback on application reviews, best practices guidance documents, and no action, interpretive letters, or responses to frequently asked questions. NFA currently is the designated self-regulatory organization (DSRO) responsible for regulating SDs and MSPs registered with the Commission. The Commission will review with NFA the registration applications of SDs and MSPs to determine whether the registrants have included policies and procedures in accordance with applicable regulations. The Commission will address issues raised by the NFA, registrants, and/or industry bodies as part of the registration process and on an ongoing compliance basis to interpret new and existing regulations applicable to these registrants and guide such registrants to adopting better business practices through compliance with the CEA and Commission regulations. Helping to ensure that governing boards have appropriate alignment of interests and are appropriately engaged in risk governance. Given the importance of chief compliance officers (CCOs) to these efforts, monitoring the proper implementation of our new CCO regulations, issuing guidance to assist CCOs to understand their obligations, ensuring that compliance with policies and procedures is effective at the firms through examinations, and review of reports required under our regulations. Diligent supervision is critical to the CCO and the risk governance and management functions. Developing and implementing Commission oversight procedures to help monitor CCO and risk management supervision activities and policies and procedures used by these functions to ensure they are effective. Indicator:  Conduct governance and risk management oversight reviews for SDs and FCMs. Target:  10 swap dealers and 10 FCMs. Description: Relying upon a risk-based and regulatory compliance oversight approach, the Commission, working with the DSROs, will conduct appropriate reviews of SDs and FCMs with a focus on the risk governance, risk management practices and, legal compliance policies and procedures of the firm. As risk governance and management and strong internal controls are of paramount importance to the proper conduct of the derivatives markets and to help ensure proper customer protections, firms should have strong procedures and controls in risk management. Indicator:  Review CCO annual reports for SDs, MSPs, and FCMs, and provide feedback to the registrants on governance and compliance oversight. Target:  75% of SDs, MSPs, and FCMs. Description: Monitor the CCO annual report filings of the SDs, MSPs, and FCMs and evaluate governance and compliance best practices, effectiveness of the evaluations, and areas for follow up with specific firms where the report is not up to expectations. Examinations are needed to help determine whether risk management, internal controls and governance are being effectively employed by each firm. In addition to the more traditional areas, it also will be important to focus on business continuity, conflict-of-interest partitions between trading and research, trading practices, disclosure to the public of appropriate information, and proper maintenance of swap data books and records. For newly regulated SDs, evaluate capital, margin, and liquidity models and the oversight of such activity by the SD’s risk management program, and assess whether these models conform to the CEA and Commission regulations. The new SD regulations impose requirements on SDs with respect to documentation of swap trading activity and the swap confirmation process. It will be important to perform reviews of the timeliness and accuracy of trade confirmations, the reporting transaction and confirmation data to SDRs, and the execution of swap trading relationship documentation, portfolio reconciliation, and compression exercises required under the CEA and Commission regulations. Indicator:  Conduct limited scope reviews of SD, MSP, and FCM risk management and internal control systems and procedures, including controls, processes and procedures over technology risks. Target:  Annually review 10 SDs/MSPs/FCMs. Description: On a risk basis, perform limited scope reviews of SDs, MSPs, and FCMs. The work performed will be based on the current risk profile of the firms and industry risk issues. Indicator:  Monitor high-risk registrants including SD, MSPs, and FCMs for signs of financial stress. Target:  100% of all SDs, MSPs, and FCMs included in the population. Description: Monitor registrant firms for financial stress by, among other things, reviewing notices and monthly and/or annual financial filings. High risk firms are identified as such through metrics developed by the Staff which consider such attributes as capital, liquidity, ratio of excess segregated to secured collateral, CPA firm, leverage ratios, etc. Develop tools to back test financial resources and evaluate sufficiency of all material product and portfolio margin requirements. Description:  The tools will seek to ensure that DCOs are calculating initial margin levels at amounts sufficient to cover historical price moves for appropriate liquidation periods. The defaulting firm’s initial margin on deposit with the DCO is the first financial resource to be used in the event of a default. The Commission needs to be proactive in ensuring DCOs are setting adequate initial margin levels. Additional aspects of this program will include documenting a comprehensive understanding of each DCO’s initial margin model and comparing margin requirements for like products cleared at more than one DCO. Develop a program to monitor firm-level variation and initial margin requirements across DCOs. Description:  Firms have to have access to sufficient liquid financial resources in order to make large variation margin payments promptly upon demand of the DCO. The program will allow the CFTC to track daily variation and initial margin requirements so that clearing firms with unusually large variation margin payment obligations will be contacted by the Commission to confirm the firm’s ability and resources to make such payments. Enhance the risk surveillance program to evaluate the risk of market participants positions held at multiple FCMs or DCOs. Description:  To help measure aggregate risk within the clearing and settlement systems under the Commission’s jurisdiction, staff will seek to aggregate futures, options, and swaps positions across all DCOs. The program will include the ability to stress test all positions and calculate initial margin requirements at each clearing FCM and DCO. The risk surveillance program will review and analyze financial risks on large trader and clearing member and all customer swap positions and determine whether they are appropriately managed by traders, firms, and DCOs. Additionally, the risk surveillance program will use stress tests of customer and clearing firm positions to determine if any firm would pose systemic risk in the event of stressed market conditions. Another aspect of the program will be the conducting of regular reviews of clearing members to determine compliance with Commission regulations regarding clearing member risk management. Develop process to combine cleared and uncleared, bilateral positions to obtain a more complete picture of a clearing firm’s risk exposure. Description:  A market participant’s uncleared bilateral position will not affect its variation or initial margin requirements at a DCO. However, additional losses on an uncleared position might affect a market participant’s ability to make a variation or initial margin payment. The Commission will use SDR data to develop procedures to combine cleared positions with uncleared, bilateral positions to have a comprehensive understanding of the risk posed by market participants registered with the Commission. Through close coordination with NFA, the Commission will review registration documentation and the policies and procedures being employed by SDs and MSPs to achieve compliance with the CEA and the Commission’s regulations and that registrants operate with an effective governance and risk management structure. Description:  NFA currently is the designated self-regulatory organization (DSRO) responsible for the regulating of SDs and MSPs registered with the Commission. The Commission will review with NFA the registration applications of SDs and MSPs to ensure the registrants have included policies and procedures in accordance with applicable regulations. The Commission will address issues raised by the NFA, registrants, and/or industry bodies as part of the registration process to interpret new and existing regulations applicable to these new registrants and guide such registrants to adopting better business practices through compliance with the CEA and Commission regulations. Conduct oversight reviews of SD and MSP risk governance and risk management framework. Description:  As risk governance and management is of paramount importance to the proper conduct of the derivatives markets and to help achieve proper customer protections, firms should have strong procedures and controls in risk management. Relying upon a risk-based approach, the Commission staff will, in coordination with NFA, conduct appropriate reviews of SDs and MSPs with a focus on the risk governance and risk management practices of such firms. Together with the DSROs, monitor the CCO annual filings of SDs, MSPs, and FCMs and, in coordination with the DSROs, evaluate best practices, effectiveness of the evaluations, and areas for follow up with specific firms where the report does not meet expectations. Description:  As CCOs file their annual reports, an effective review of the documents will provide insight into the role of the CCO at the organization, the adequacy of CCO policies and procedures and the overall tone of the organization to compliance. By following up on these reports with each CCO, the Commission, working closely with the DSROs, will be able to work with the CCO to help ensure the CCO is properly focused and the policies and procedures of the organization are reasonable. Conduct limited scope reviews of the risk management and internal control systems and procedures of SDs and FCMs. Description:  Commission staff will coordinate with the DSROs to perform limited scope reviews of SDs and FCMs to help assess the firm’s compliance with the CEA and Commission regulations. Particular focus will be given to the firms that may pose higher risks and their procedures and processes regarding risk management, internal controls, and customer protection. In addition, the reviews will seek to assist firms with understanding the requirements of the CEA and applicable regulations in these areas and encourage the use of identified best practices in this regard. Monitor firms for financial stress by, among other things, reviewing monthly and annual financial filings, as well as notice of specific events. Description:  The Commission staff regularly receives financial data from firms, as well as notices of specific events. Accordingly, staff will coordinate with the DSROs to perform timely reviews of the filings and use such data to monitor the financial condition of SDs and FCMs. In the event of unusual stress, the Commission, working closely with the DSROs, will perform either a targeted review or coordinate with the DSRO on the performance of a review. Receiving data electronically and automating its distribution throughout the Commission (including automatic updating of CFTC systems like RSR) using business process automation software will reduce latency between industry reporting of financial data and staff evaluation of margining and financial risk. Increasing application of data standards, including Legal Entity Identifiers (LEIs), will support more efficient data aggregation, including customer/account level aggregation across related markets, to more comprehensively assess risk. Increasing use of Application Programming Interfaces (APIs) and web services for regulatory data reporting will facilitate rapid development of surveillance systems. Actively engaging with DCOs to identify and potentially re-use or extend margining and other software algorithms to meet unique Commission requirements will facilitate more rapid CFTC systems development. Staff development and back-testing of margin and stress models for swaps data that is unique to the Commission’s oversight role. Use of non-futures market data to identify futures market participants with excessive risk or under financial stress. Enhancing data management tools and procedures will streamline reporting to the Commission. Continuously identifying and developing enhanced financial analytical tools will support the evaluation of financial data received from registrants. Using industry-standard tools will facilitate review of FCM and CPO/CTA risk management. Increasing integration between NFA and CFTC systems (e.g., NFA FACTS 2000 and registration systems and the CFTC RSR system) through secure data transfers and use of portal services will increase staff efficiency by providing faster access to comprehensive swaps data. Through the goal of Comprehensive Enforcement, the CFTC enforces the CEA and Commission regulations, and works to promote awareness of and compliance with these laws. Enforcement strives to expeditiously assess tips, complaints, and referrals regarding suspicious activities and potential violations; to rigorously and thoroughly investigate such alleged wrongdoings; and to effectively prosecute violations and seek imposition of appropriate sanctions. The Commission’s enforcement efforts in FY 2014 through FY 2018 will be guided by new and expanded authorities provided by the Dodd-Frank Act and the new regulatory requirements implemented pursuant to the Dodd-Frank Act. These include the addition of new and broader fraud and manipulation provisions augmenting the Commission’s existing authority, new prohibitions targeting disruptive trading practices and other misconduct on registered entities, and new false reporting prohibitions. Other expansions include anti-fraud and anti-manipulation authority over swaps, clarified jurisdiction with respect to retail foreign currency transactions, and new authority over retail commodity transactions such as those involving precious metals. As certain new regulatory requirements are in effect or coming into effect, the Commission will focus on ensuring such requirements are enforced as appropriate. In addition, the Commission will maintain its focus on pre-Dodd-Frank Act enforcement authorities, particularly with respect to the investigation and prosecution of frauds against retail customers, benchmarks, supervision failures, record-keeping, reporting and trade practice violations. At the front-end of the Enforcement function are the mechanisms and processes by which the Commission receives, evaluates and reacts to a large volume of tips, complaints and referrals each year. Sources for these potential leads are varied, and include the public, self-regulatory organizations, exchanges, criminal law enforcement partners, and other federal regulatory agencies. Enforcement seeks to implement a prompt and efficient review process to quickly identify those leads with the greatest investigative value, so that they can be assigned to an Enforcement team for further inquiry. In FY 2011, the Commission established a Whistleblower Office (WBO) in accordance with the Dodd-Frank Act’s provision requiring that funds collected from monetary sanctions be set aside to award and incentivize whistleblowers who voluntarily provide original information related to violations of the CEA that lead to the successful enforcement of a covered judicial or administrative action, or any other related action (as set forth in the CEA). Continued development and promotion of the WBO will add to the Commission’s overall capacity to encourage the reporting of critical, time-sensitive information related to suspected violations. Indicator:  Strengthen and ensure a coordinated approach to receiving, assessing, and referring tips, complaints and referrals as necessary and appropriate; if resources permit, establish a unit or office dedicated to this function. Description: This measure reflects the need of the Commission to enhance its capability to receive, analyze and process tips, complaints and referrals, and focuses in particular on the preliminary analysis which inform the Division’s decision whether to devote more resources to a full investigation. The Commission will evaluate and refine the current processes and mechanisms, if necessary, for handling leads from all sources to increase the effectiveness and efficiencies of those processes and mechanisms. If resources permit, the Commission may establish a unit within the Division of Enforcement staffed with attorneys, investigators and analysts that will handling the intake and triage of tips and leads from all sources. Indicator:  Develop a comprehensive communication strategy, geared for internal and external stakeholders, relating to the role of whistleblowers and the function of the Whistleblower Office. Description: This measure reflects the need of the WBO to communicate effectively both internally and externally. Internal communication allows the WBO staff to train and inform the Commission staff about the WBO, the relevant law surrounding the role of whistleblowers, and the unique and protected nature of whistleblower identifying information. Internal communication also informs the WBO staff about external persons to whom they need to direct their message. Outreach is an essential part of the program. The WBO will send the message that the program is in place and emphasize in its message the rewards and protections offered by Section 23 of the CEA and the Commission regulations. Whistleblowers provide the Commission with the opportunity to receive timely information relating to potential violations of the CEA that may not otherwise be available. Enforcement investigations are opened once preliminary inquiries into suspected violations of the CEA and Commission regulations indicate that further investigation is warranted. The Division employs various investigative plans, analytics, and tools until sufficient evidence is obtained to determine whether or not a violation occurred within the jurisdiction of the Commission. The Commission will seek improvements and innovations in investigative techniques to meet the challenge of promoting market integrity and protecting market participants in increasingly complex markets. Technical assistance will be gained through coordination with internal and external analytical experts. Added emphasis will be given to conducting investigations that stand to have a significant impact on market behavior. Indicator:  Percentage of enforcement investigations completed within 18 months of opening, depending on the nature and scope of investigations. Target:  Baseline in 2015, set targets annually. Description: This measure identifies the percentage of investigations that the Commission closes within 18 months of their opening, depending upon the nature and scope of the investigations and resources available. In conducting investigations, the enforcement program endeavors to complete effective and fair investigations in a timely manner. Investigations may result in the Commission filing an enforcement action, referring the matter to another authority for investigation and enforcement, as appropriate, or a decision to close the investigation without recommending an enforcement action. The need and desire for timeliness in enforcement investigations is tempered by the fact that many such investigations are complex, resource intensive or involve a certain level of coordination and cooperation with domestic and international governmental authorities. Market users and others must be protected from possible wrongdoing that could harm market integrity. The range of available enforcement charges (including manipulation, disruptive trading practices, anti-fraud, and false reporting) broadened in 2011 and 2012 when relevant provisions of the Dodd-Frank Act became effective. The Commission can prosecute violations in the United States District Courts, or via administrative proceedings. If evidence of criminal activity is found, matters are referred to the U.S. Department of Justice or state authorities for prosecution of violations of the CEA or federal and state criminal statutes, such as mail fraud, wire fraud, and conspiracy, as well as obstruction of justice and perjury. The Commission employs a variety of sanctions against violators, including revocation, conditioning or suspension of registration, prohibitions on trading, cease and desist orders, civil monetary penalties, undertakings, and disgorgement and restitution orders. The Commission may also seek federal court injunctions, restraining orders, asset freezes and receiver appointments. The Commission will continue to seek necessary and appropriate relief for violations including redress to victims of unlawful activity. In addition to taking actions against violators, the Commission cooperates with and supports enforcement efforts by other law enforcement officials (domestic and international), and supports education and other outreach to protect market users and deter future misconduct. Solicit high quality tips, complaints and referrals from CFTC divisions and offices, and self-regulatory organizations. Description:  To increase the quality of tips, complaints, and referrals, the Commission looks at trends (e.g., through RERs and surveillance functions), and encourages early reporting of concerns and market events that will likely lead to referrals. For the same reason, the Commission promotes regular consultation between and among CFTC staff across all divisions, regular meetings with SROs, and the provision of training and guidance about how to identify indicators of potential misconduct. Further develop, strengthen, and maintain areas of expertise relevant to the CEA, as amended by the Dodd-Frank Act, Commission regulations, and ever-changing market innovations and technologies. Description:  Since prior to and continuing after the enactment of Dodd-Frank Act, the Commission has had targeted Division of Enforcement training as well as Commission-wide training to ensure staff has the necessary knowledge and expertise to effectively investigate and litigate under the CEA. See subpart (d) below. In addition, the Commission assigns staff with established expertise to cases with less experienced staff. The Commission is focused on ensuring staff always has the necessary tools and expertise to handle the Commission’s most complex cases involving manipulation, disruptive trading, and trade practice violations. The Commission also looks to the development of new subject-specific areas of concentration within its jurisdiction. Recommend proportionate sanctions in a consistent manner. Description:  Sanctions in enforcement proceedings are imposed to further the CEA’s remedial policies including deterring the defendant and others from committing similar violations. The Commission considers the gravity of a violation and a variety of other factors, aggravating and mitigating, in determining appropriate civil money penalties to seek in court or to impose itself. The Commission strives to strike the proper balance among the applicable factors in reaching fair and just sanctions, and to impose sanctions in a consistent and transparent fashion. Advance a training and development program that focuses employee proficiency and career development, and that addresses the dynamic knowledge requirements of the Dodd-Frank Act legislation. Description:  Following an assessment in 2012 of Enforcement learning and development needs, the Division implemented a reproducible and economically efficient training strategy that delivers training in a range of formats chosen to best serve the content and training goals. Initiatives include, but are not limited to:  A “brown bag” series; Dodd-Frank Act-specific seminars; industry/technical training geared towards an enforcement audience; and a mentoring program. Where applicable, these initiatives draw on expertise across the Commission, in addition to that of contracted providers. Boost public awareness of the Commission and its role in regulating financial markets. Description:  To increase compliance with the Commission’s rules and heighten its public presence, the Commission will seek opportunities to explain the intent and requirements of its rules to stakeholders, and to publicize enforcement capabilities and successes. This will be achieved using a range of methods, including targeted public presentations and appearances, participation on interagency task forces, press and public affairs strategies, the Commission’s website, and social media vehicles. Promote public information campaigns to enhance consumer ability to detect and avoid fraudulent and other abusive business practices. Description:  In FY 2012, the Commission established an Office of Consumer Outreach, in accordance with the Dodd-Frank Act’s mandate to set aside funds from monetary sanctions to provide education initiatives to help customers protect themselves against fraud or other violations of the CEA or Commission regulations. The Office of Consumer Outreach will launch targeted campaigns educating consumers to help them protect themselves against fraud. Update eLaw technology to more effectively investigate and litigate cases and increase program efficiency. Description:  Litigation support and technology requirements including the enforcement’s case management systems will be enhanced to further automate the Enforcement business process, from intake to investigation to litigation. Implementation of new tools and enhancements to existing tools for tips and referrals, early case assessment, deposition management, case management, forensics, eDiscovery, searching, and analytics will support both a higher volume of investigations and litigation and more effective measurement of program results. Better integration of unstructured investigation-related data with structured surveillance and position, increased integration of eLaw with tools used by surveillance and compliance staff, and increased use of data discovery tools by enforcement staff will enable more proactive identification of high-impact enforcement leads. Improved mobile computing, mobile communication services, increased after-hours technical support, and a secure platform for collaboration with external stakeholders will increase the productivity of enforcement staff. Continuing IT investment in the eLaw program will support all Comprehensive Enforcement Goal objectives by improving staff productivity, leveling the IT-playing field between staff and those it investigates, providing effective tools for collaboration with other CFTC staff and other regulators, and facilitating the use of information to identify high impact enforcement actions. Increasing litigation support services will support rising case volumes and more complex enforcement actions. Extensively using learning management and electronic learning will improve the overall knowledge and proficiency of enforcement staff and provide organizational flexibility. Enhancing eLaw program technology (case assessment and management, document review, eDiscovery, forensics, searching, analytics) will address rising case volumes, complex enforcement actions, and extensive use of technology by opposing counsel. Further integrating eLaw with tools used by surveillance and compliance staff, and use of data discovery tools by enforcement staff will enable more proactive identification of high-impact enforcement leads. Improving mobile computing, mobile communication services, expanding after-hours technical support, and establishing a secure platform for collaboration with external stakeholders will increase the productivity of enforcement staff. Enhancing data management tools and procedures will better establish single authoritative data sources and increase appropriate sharing of data between enforcement and surveillance activities. Implementing the President’s digital government strategy to implement mobile applications on CFTC.gov will expand consumer and industry participant awareness of CFTC oversight and enforcement. Derivatives markets are global and events taking place in markets outside the United States may affect U.S. markets and persons and vice versa. Effective regulation of such interconnected markets therefore requires cooperation and coordination with numerous domestic and international authorities. Effective regulation also necessitates active outreach to the public, market participants, and other interested parties. The Commission proactively engages in outreach to, and cooperation and coordination with, its fellow regulatory authorities, both foreign and domestic, to identify regulatory concerns and develop solutions. The Commission works closely with its regulatory counterparts abroad, as well as with relevant international organizations, to promote high-quality derivatives regulation worldwide. The CFTC also provides technical assistance to emerging and recently-emerging markets to help these jurisdictions in establishing and implementing laws and regulations that foster global market integrity. The Commission works with key jurisdictions that have responsibility for derivatives regulation to support the adoption and enforcement of strong and consistent standards. When necessary, the Commission works with fellow regulators to develop concrete, practical solutions where there may be conflicting or duplicative application of rules. In addition, the Commission and other regulators seek to identify regulatory gaps in the application of law across jurisdictions in order to reduce the potential for regulatory arbitrage. The Commission’s Dodd-Frank Act rulemaking has generated unprecedented outreach and communication efforts with our fellow authorities in Europe, Asia, and other parts of the world. The Commission also places a high priority on the enforcement of international, federal, and state civil and criminal laws arising from violations of the CEA. The Commission partners with other domestic and international authorities to coordinate enforcement investigations and prosecutions. The Commission is committed to transparency in all aspects of its regulatory program. It provides such transparency in a variety of ways, including through a comprehensive program of outreach to all persons who may be affected or have an interest in the Commission’s regulatory programs. These stakeholders include the public, users of derivatives markets (both domestic and international), as well as Congress, U.S. government agencies, and international regulatory authorities. The Commission engages in such outreach:  (1) To explain its regulatory policies; (2) to provide guidance to registrants and other market participants; (3) to share staff research; (4) to identify developing trends; (5) to exchange views with domestic and international authorities; and (6) to gather information that may indicate a regulatory concern and the need for action to address it. In short, this outreach is not only a means by which the Commission provides transparency into the actions of the Commission, but also a means by which it obtains data, information, and other inputs that enable the Commission to identify needs, further develop its regulatory program, and be more responsive to its stakeholders. Indicator:  Number and types of opportunities that have been provided for the exchange of views between the Commission and other domestic and international regulators. Target:  To-be-determined. Set baseline in 2014/2015 and targets in subsequent years. Description: Conferences and meetings, such as Commission advisory committee meetings, research seminars, international regulator conferences, and briefings for Congressional staff and other government officials. This also includes meetings with SEC, U.S. Federal Reserve System, U.S. Department of the Treasury, as well as participation in country dialogues under auspices of the Treasury Department. Indicator:  Number and types of opportunities that have been provided for the exchange of views between the Commission and the public. Description: Conferences and meetings, such as Commission advisory committee meetings, rulemaking meetings, research seminars, international regulator conferences, and briefings that are open to the public. Futures and swaps markets under the Commission’s jurisdiction are part of a global industry. The Commission engages in a variety of activities with international regulatory and market authorities to promote consistent regulatory and enforcement standards and practices and to develop supervisory and enforcement cooperation and coordination arrangements with international authorities. Achieving consistency in international standards and practices supports the Commission’s regulatory and enforcement efforts in the United States and encourages strong oversight and enforcement worldwide. This also will help further the international regulatory reform agendas of G-20 nations to mitigate risk, improve transparency and protect against market abuse, and to prevent regulatory gaps, reduce the potential for arbitrage opportunities, and foster a level playing field for market participants, intermediaries, and infrastructures. The Dodd-Frank Act increased the need for international outreach. Section 752 of that Act states that the Commission “shall consult and coordinate” with foreign authorities regarding the regulation of swaps, futures, and options on futures. Consistent standards and practices do not mean identical standards and practices. Legal systems and market conditions differ among jurisdictions, and each national authority has ultimate responsibility to protect against all sources of risk to its markets consistent with its national legislation, regulatory philosophy, and market structure. Rather, this objective seeks to:  (1) Promote an international consensus on attaining high levels of common regulatory policies and practices; (2) develop concrete and practical solutions with respect to any conflicting application of rules; (3) identify regulatory gaps; (4) reduce the potential for regulatory arbitrage; and (5) encourage the effective exchange of information for enforcement purposes. These goals are achieved through active participation in international standard-setting bodies. The Commission also helps to encourage sound global regulatory and enforcement practices by sharing the Commission’s regulatory and enforcement techniques and policy considerations with other regulatory authorities. Effective oversight of regulated entities in a modern globally-connected market is complicated by the fact that many entities and persons who are registered with the Commission also are active in international markets and subject to regulation by international jurisdictions. The location of a Commission registrant outside the United States complicates the Commission’s ability to access information, conduct on-site auditing visits and otherwise perform routine monitoring of registrants. Furthermore, threats to systemic stability are not necessarily confined to domestic activities and may include the behaviour of a registrant’s international activities. It is critical, therefore, that the Commission develop arrangements with international regulatory authorities to facilitate the supervision of registrants located outside the United States, obtain and provide needed information, and coordinate the supervision of dually-registered firms. This is particularly important as many of the new entities subject to regulation under the Dodd-Frank Act are located abroad and the Commission must closely coordinate with international regulators in order to supervise these global entities. In addition, cooperating and coordinating with other domestic and international authorities (including the development of information-sharing arrangements) supports the Commission’s regulatory efforts. Such actions strengthen the Commission’s supervision of markets and entities that are global in nature; they promote high-quality derivatives regulation worldwide; they facilitate the identification and resolution of potential systemic or other risks that may affect the United States; and they enhance the Commission’s enforcement efforts to protect U.S. customers. Indicator:  Number and types of projects that have been initiated and/or completed within international regulatory and standard setting groups that promote the CFTC’s regulatory policies. Description: Projects within standard-setting organizations such as the International Organization of Securities Commissions (IOSCO). Indicator:  Number of regulatory cooperation and coordination arrangements negotiated with international regulatory authorities to facilitate high-quality derivatives regulation worldwide and the CFTC’s supervision of markets and entities that are global in nature. Description: Memorandum of Understandings (MOUs) and other arrangements (e.g., letters setting out respective cooperation efforts) needed in connection with oversight of international registered swap dealers and CCPs. The CFTC provides technical assistance to emerging and recently merged markets to assist these jurisdictions in establishing and implementing laws and regulations that minimize the likelihood of regulatory arbitrage and promote cross-border enforcement and supervisory assistance. Indicator:  Number of non-U.S. regulators trained. The goal of robust domestic and international enforcement cooperation and coordination is to partner with other domestic and international authorities to sustain and encourage cooperative relationships in an enforcement context. The aim of domestic enforcement coordination is to ensure that enforcement of actions arising out of violations of the CEA is addressed through civil, criminal, or administrative prosecutions by, or in coordination with, state and federal governmental agencies whenever possible. The objective of international enforcement cooperation is to obtain cross-border assistance from other international enforcement authorities in connection with Commission enforcement investigations and prosecutions, and to provide reciprocal assistance to our international counterpart regulators. Indicator:  Leverage the impact of its enforcement program through coordination with Self-Regulatory Organizations (SROs) and active participation in domestic and international cooperative enforcement efforts. Description: This measure will reflect the Commission’s continued participation in regular meetings with the SROs and with domestic and international cooperative partners. The Commission’s enforcement program regularly meets with the SROs to discuss matters of common interest; including investigations, enforcement actions, and the sanctioning of violative conduct. The Commission’s enforcement program also works cooperatively with both domestic and international authorities to maximize its ability to detect, deter, and bring sanctions against wrongdoers involving U.S. markets, registrants, and customers. These cooperative efforts bolster the effectiveness of the enforcement program by allowing it to investigate and litigate more efficiently, and seek penalties that provide the appropriate punitive and deterrent effect. Provide opportunities for exchange of views between the Commission and other regulators and/or the public. Description:  The Commission organizes a variety of forums to obtain the views of stakeholders (i.e., users of derivatives markets, persons who may otherwise be affected by the Commission’s regulatory program, financial intermediaries, international regulators and market authorities) on the Commission’s regulatory agenda and contemporary issues. These forums include the Commission’s Advisory Committees, the annual International Regulators meeting hosted by the Commission, various “roundtables” focusing on proposed regulations or policies and ad hoc conferences in which Commission staff and invited experts discuss cutting edge issues or research (e.g., Office of the Chief Economist research conferences). All of these forums facilitate communication between the Commission and stakeholders on issues that affect the integrity and competitiveness of U.S. markets and alert the Commission to issues that might require regulatory development. Actively participate in high-quality international-based forums where regulatory issues are discussed. Description:  The Commission strives to participate actively and selectively in high-quality forums organized by international authorities where issues affecting the Commission’s regulatory program, customer protection, market integrity and/or the competitiveness of U.S. futures and swaps markets are discussed. The Commission uses these opportunities to communicate its policy views and exchange views with international authorities. Participation in such forums has a variety of objectives:  foster greater understanding of Commission policies, exchange views on matters of developing regulatory concern, encourage the development of high regulatory standards, and develop trust and confidence among regulators that can help facilitate sharing information and addressing regulatory and enforcement emergencies. Actively cooperate and coordinate with other entities within the U.S. government. Description:  The Commission, through the activities of its Office of Legislative Affairs, Office of General Counsel, and individual operating divisions, actively communicates and cooperates with representatives of the United States Congress and other governmental entities. These activities include coordination of policy approaches with other government entities on a bilateral basis, participating in multi-agency forums to address areas of shared responsibility, and providing technical assistance on questions relating to the futures and swaps markets. Through these efforts, the Commission provides requested information, undertakes joint initiatives in areas of mutual interest, and discusses financial regulatory policy and proposed legislation. Such interactions with Congress, and other U.S. governmental entities, facilitates the development of informed and consistent financial regulatory policy within the U.S. government. Actively participate in international standard-setting organizations. Description:  The Commission actively participates as a Board member in IOSCO, the standard-setting body for derivatives and securities regulation. Within IOSCO, the Commission participates in most of the committees and task forces, including co-chairing the Committee on Commodity Futures Markets, the OTC Derivatives Task Force and the Task Force on benchmarks. Additionally, the Commission participates in the Financial Stability Board, G-20 Working Groups, and other international bodies and ad hoc work groups that facilitate the development of standards and practices. The Commission’s active participation in such standard-setting bodies and working groups is intended to influence those bodies and groups to adopt high-level standards and practices that are consistent with the Commission’s overall regulatory and enforcement policies. Develop arrangements for regulatory and enforcement cooperation and coordination with international authorities. Description:  The Commission regularly communicates with international authorities to coordinate and collaborate on supervision, regulation and policy approaches. The expansion of the Commission’s regulatory oversight under the Dodd-Frank Act to cover OTC derivatives will increase the frequency of consultations with foreign governments. In addition, Section 752 of the Dodd-Frank Act encourages the Commission to enter into information-sharing arrangements with foreign regulators. The Commission will therefore develop new arrangements contemplated under the Dodd-Frank Act, develop other needed cooperative arrangements as may be needed to address future regulatory and enforcement issues and, once such arrangements are in place, the Commission will cooperate with foreign jurisdictions pursuant to the terms of such arrangements. Provide technical assistance to international authorities. Description:  The Commission provides technical assistance to foreign markets to assist these jurisdictions in establishing and implementing laws and regulations that minimize the likelihood of regulatory arbitrage and promote cross-border enforcement and supervisory assistance. The Commission will continue to provide technical assistance to international regulators in a wide variety of subject areas. Such technical assistance may take various forms, including targeted programs in specific areas of concern, such as clearing, market oversight, unique areas of swaps supervision, and enforcement. The Commission also provides technical assistance by hosting international missions at the Commission and through the annual Commission training symposium. Partner with law enforcement agencies at the national, regional, and state levels. Description:  The Commission places a high priority on domestic cooperative enforcement coordination with state and federal governmental agencies. In October 2002, in the wake of the formation of the President’s Corporate Fraud Task Force (comprised of the Commission, the SEC, the Federal Reserve, and the Department of the Treasury), the Commission established the Office of Cooperative Enforcement within the Division of Enforcement (DOE). The Office of Cooperative Enforcement works closely with members of the Corporate Fraud Task Force, the President’s Financial Fraud Enforcement Task Force (chaired by the Attorney General and comprised of the Commission and 20 other federal agencies), State Attorney Generals, State Securities Commissions, and local law enforcement groups to achieve domestic cooperative enforcement in three ways. First, they coordinate joint enforcement efforts between the Commission and other government agencies on significant investigations and cases. Second, they provide training and expert assistance to other governmental agencies in their efforts to prosecute violations of federal and state civil and criminal laws arising from violations of the CEA. This includes providing expert help and technical assistance with case development and trials to other agencies and making arrangements to lend attorneys, investigators, and experts to other agencies to assist in investigations and trials. Finally, they reach out to other government agencies to establish working relationships for the purpose of sharing information on civil and criminal violations of the CEA. Obtain and provide enforcement investigative assistance to and from international authorities. Description:  The Commission recognizes that enforcement investigations now regularly involve significant cross-border components. Effective information-sharing arrangements and practical international relationships are vital to ensure the Commission’s ability to access the critical information and documents necessary to properly investigate possible violations of the CEA and Commission regulations. The DOE’s Office of Chief Counsel regularly utilizes existing formal information-sharing arrangements, such as the IOSCO Multilateral Memorandum of Understanding and bilateral Memoranda of Understanding, as well as informal information-sharing arrangements, to request and obtain information and other assistance from international regulators relating to ongoing enforcement investigations and prosecutions. The Office of Chief Counsel also provides reciprocal cross-border assistance to international regulators in connection with international enforcement investigations. Increasing application of international data standards for identifying legal entities and products and global harmonization of SDR data will help surveillance staff assess. positions, understand financial exposures, and evaluate trade party and systemic risk. Improved mobile technology will increase staff productivity while on business trips. To advance meeting mission goals and objectives, the CFTC will achieve Commission-wide excellence by empowering strong, enterprise-focused leaders, maintaining a high performing, accountable and engaged workforce, and ensuring effective stewardship of resources. The CFTC will build and maintain a high-performing, diverse, and engaged workforce through implementing innovative recruitment and retention programs, promoting transparent and clear communication, and developing and equipping leaders at all levels of the organization. The CFTC will also achieve Commission-wide excellence by managing resources effectively. The Commission will expand internal controls, governance, and planning processes and ensure that staff has the knowledge, data and technology, and other tools to work effectively. The CFTC is committed to consistently attracting, hiring, developing, and retaining a high-performing, diverse, and engaged workforce. The CFTC continually develops its human capital programs, to create a robust talent pipeline that meets current and future workforce needs, enhance employee engagement and retention, invest in training and development to address competency gaps, and maintain high performance. The CFTC works to identify and achieve mission-critical roles and attract and maintain an agile workforce that is prepared to support our financial regulatory capabilities and respond effectively to changes impacting the nature of our work and employees. Indicator:  Implement Operational Planning across the Commission. Description: Design, develop, and implement annual division/office operational plans based on the CFTC Strategic Plan. Operational plans ensure strategic goals and objectives are achieved through approved and coordinated tactical goals and objectives. Operational Plans are resource constrained and describe milestones, conditions for success and explain how, or what portion of, a strategic plan will be put into operation during a given operational period. A five-year strategic plan would typically require five sets of operational plans funded by five operating budgets. Indicator:  Implement performance management plans for executives. Description: Design, develop, and implement an enhanced performance management program to gain transparency, accountability, credibility, and to properly reward performance. The program will establish performance standards, help to properly identify goals, and hold senior staff accountable for performance results. It will lay the foundation for sustainable growth and help achieve effective organizational performance. Indicator:  Establish and implement an Individual Development Plan (IDP) strategy. Target:  90% of employees with IDPs. Description: As the nature of CFTC positions changes as a result of new regulatory requirements, it is critical for supervisors to anticipate what skills will be needed to implement the new requirements, and to take steps to build those competencies and knowledge in the workforce. To that end, supervisors will discuss development and training goals with employees during quarterly progress reviews. Indicator:  Establish certification programs in executive, supervisory, and one core subject matter function. Target:  70% of eligible employees. Description: CFTC will develop and establish certification programs to ensure that employees at all levels have the most up-to-date tools and competencies. For example, an executive certification program is critical for leadership positions, a supervisory certification program is vital for effective human capital management, and swaps certification is essential for carrying out the mission of the CFTC. Indicator:  Increase Employee Viewpoint Survey scores to achieve and maintain a ranking of Top 10 in the Best Places to Work. Target:  Baseline in 2014, 8% increase in employee engagement. Description: Annually, CFTC will identify areas of greatest need and focus on enhancing or implementing programs, campaigns, or policies that will contribute to increasing those scores. Indicator:  Number of diversity-related partnerships and alliances. Description: Each fiscal year, CFTC will pursue two formal partnerships with organizations in order to advance the Commission’s competency, diversity, and outreach priorities. Formal partnerships through memoranda of understanding provide a systematic method for reaching target populations aligned with the Commission’s employment and outreach goals. The partnerships will help position the CFTC as an employer of choice among target communities and will help CFTC disseminate key anti-fraud messages to key communities. The CFTC has a responsibility to the public to ensure the effective stewardship of resources, while meeting its mission requirements. The CFTC will meet this objective by increasing the scope of its internal controls and governance programs, formalizing the Commission’s planning and budgeting processes, equipping decision makers with the appropriate data, and implementing better data management programs. Commission employees operate programs and utilize resources consistent with the CFTC mission, in compliance with laws and regulations, and with minimal potential for waste, fraud, and mismanagement. Indicator:  Improved satisfaction among CFTC staff with management programs and services. Target:  Survey/baseline in 2014 and annual target thereafter. Description: Resource allocation, including financial, human, and information technology resources, is one of the primary services provided by mission support. The Office of the Executive Director (OED) and the Office of Data and Technology (ODT) will design and conduct a survey in FY 2014 that addresses key services provided by each office to establish a baseline. At least two of the services on which staff will be surveyed will be services that are integral to CFTC resource allocation processes. The survey will be conducted semi-annually FY 2015 – FY 2018. Indicator:  Decrease in per employee operating costs. Target:  Baseline in 2014, establish annual targets thereafter. Description: OED and ODT will identify program areas with predominantly stable output or service requirements and operations and maintenance activities and establish baseline total cost of ownership for those program areas in FY 2014. Each office will initiate savings initiatives with a positive return on investment and define target annual decreases for FY 2015 through FY 2018. The CFTC is committed to conducting outreach initiatives to help the public protect themselves from fraud and other violations under the CEA. To meet this objective, the CFTC’s Office of Consumer Outreach follows a social marketing planning process. This process produces a comprehensive plan which includes measurable objectives and effective tactical plans. Indicator:  Launch long-term anti-fraud campaign. Target:  Milestone; fully operational campaign. Description: The Office of Consumer Outreach will launch a long-term campaign. The campaign will use a multitude of outreach tactics and channels to disseminate messages leading to the behaviors that are anticipated to achieve fewer incidences of fraud. Indicator:  Finalize and monitor campaign success measures. Target:  Survey/baseline and annual report. Description: The Office of Consumer Outreach will finalize baseline campaign success measures including campaign media impact and survey respondents who report checking the background of financial products or professionals with a government source, a belief that government sources will address reported instances of fraud, and an awareness of the signs of fraud persuasion. Once baseline measures are set, the Office of Consumer Outreach will conduct annual surveys to determine any changes. Description: The CEA Section 23(g)(5) requires the Commission to transmit an annual report to the Committee on Agriculture, Nutrition and Forestry of the Senate, and the Committee on Agriculture of the House of Representatives, including among other things, customer education initiatives that were funded by the Fund during the preceding fiscal year. The Office of Consumer Outreach will submit annually its portion of the report. Recruit, Develop, and Retain Highly Qualified Staff. Description:  The CFTC will attract high-quality employees through targeted recruitment methods and innovative workforce planning activities that are designed to address current and emerging mission requirements. The CFTC will develop a proactive sourcing strategy that identifies qualified candidates and execute recruiting activities that leverage accurate workforce planning data to fulfill the organization’s human capital needs. To accomplish this, the CFTC will apply hiring flexibilities/authorities and recruitment strategies to actively build a diverse applicant pool, develop and expand strategic partnerships and alliances with educational institutions, and develop and implement an outreach plan to include a variety of applicant sources (e.g., veterans, persons with disabilities, minorities, students, women, etc.). The CFTC will develop employees to meet current and future workforce needs by establishing a program to groom emerging leaders, investing in the assessment and enhancement of skill sets and competencies through development programs, promoting and monitoring the use and application of Individual Development Plans (IDPs), and creating career-path roadmaps and opportunities for core positions. IDPs will place special emphasis on new and emerging subject matter requirements, such as knowledge of swaps and derivatives. 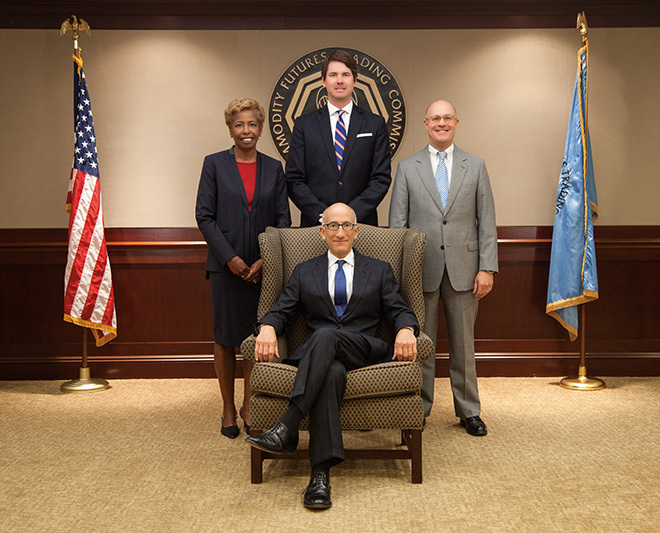 The CFTC will retain a highly efficient workforce through executing innovative learning and development activities that correlate directly with IDPs, enhancing the CFTC on-boarding program to assimilate new employees, promoting a culture of autonomy and mission engagement, developing a comprehensive diversity and inclusion program, and annually reviewing and offering a competitive compensation and benefits package. Develop and Equip Enterprise-focused Leadership. Description:  In order to meet its strategic goals, the CFTC must develop and equip leaders at all levels of the organization to be effective, efficient, visionary, and demonstrate an integrated understanding of programs and functions. The CFTC will utilize IDPs to develop current and new leaders. The plans may highlight opportunities such as mentorships, job rotations, and formal classroom training and online learning. Such activities will enhance the competencies of leaders, support the CFTC’s succession planning program, and promote collaboration of leaders across the Commission. The Commission will grow leaders by expanding its executive program with initiatives that may include mandatory training requirements, executive coaching, 360 degree assessments, and individual performance metrics tied to specific leadership objectives. These tools will not only focus on leading specific organizational programs but will also promote cross-organizational collaboration and teamwork. Current leadership competencies will be further enhanced through annual performance goal reviews, aligning performance plans with the Commission’s strategic goals and objectives, and including measurable results to enhance accountability, collaboration, and a Commission-wide focus. An executive certification program will be established based on executive competencies and have a focus on promoting cross-divisional transparency, educating supervisors on their programmatic and leadership responsibilities, and enabling leaders to set clear expectations and objectives for their teams to achieve organizational accountability and effectiveness. Increase Transparency and Communication of Commission-wide Vision, Mission, and Policies. Description:  Improving internal communication and transparency leads to a better workforce comprehension of the agency’s mission, vision, and values. The Commission will encourage this change by implementing governance models, hosting listening sessions and town halls, and developing communication plans that enforce new and current policies and procedures. These efforts will also address the need for open, cross-division, Commission-wide regulatory policy and rule-writing debates and dialogue. Although policy and procedures play a significant role, leadership will be equally important. Leadership plays a vital role in fostering two-way communication with staff and engaging them in dialogue and decision-making. Additionally, CFTC will enhance its communication efforts by incorporating change management best practices that are aligned with the long-term vision and interests of the Commission. Expand Management Support and Data and Information Technology Internal Controls, Governance, and Planning. Description:  A strong internal controls program will help the CFTC to achieve the objectives of effective and efficient operations, reliable financial reporting, and compliance with applicable laws and regulations. Internal controls will be expanded to assess risk on a Commission-wide basis and allocate resources to mitigate that risk accordingly. Leadership will be evaluated on their ability to identify and mitigate risks. An appropriately sized and strategically focused Commission-wide resource governance process will be implemented and sustained. The Commission will expand access to and controls over regulatory and internal management data and records through the creation of maintainable data catalogs, standards and guide books, and implementing cross-divisional approval of access to enterprise data. The Commission will also improve quality of data through better implementation of reporting rules, data audits, data management practices, and technology. The Commission will focus on enterprise reference data and will streamline processes for and increasing controls around ad-hoc and recurring data requests from market participants. The CFTC will implement a controlled unclassified information (CUI) program that complies with Executive Order 13556 “Controlled Unclassified Information” in order to standardize Commission procedures for handling information that is protected from public disclosure but is not classified, and align the procedures with National Archives and Records Administration (NARA) guidance. The Commission will implement additional system controls over sensitive personally-identifiable information (information which if lost, compromised, or disclosed without authorization, could result in substantial harm, embarrassment, inconvenience, or unfairness to an individual) and research information that contains proprietary information. The additional controls will include data loss prevention (DLP) technology that detects potential data breaches and data ex-filtration transmissions and prevents them. The Commission will also implement additional cyber security controls in accordance with Department of Homeland Security (DHS) guidance for continuous diagnostics and mitigation, which prescribes increasing cyber security network sensor capacity, automating sensor collections, and prioritizing risk alerts. Collectively these activities will improve the effectiveness of both mission area and mission support analysis and decision-making. The CFTC will expand its strategic and operational planning process to better unite the various functional plans including, but not limited to, financial, human capital, and information technology plans. A unified planning process will lead to better use of resources and facilitate effective resource governance. Most important, it will increase the Commission’s agility in responding to and adapting to external changes and derivatives market evolution. All Employees Have the Knowledge, Tools, and Resources to Effectively and Efficiently Accomplish the CFTC Mission. Description:  The CFTC will develop and implement a ‘CFTC New Hire Guide and Checklist’ for supervisors and will expand the current CFTC orientation to provide practical information on relevant CFTC policies, technology resources, business processes, management of federal records, and other organizational tools needed to excel in their positions while employed with the CFTC. The CFTC will promote a knowledge-sharing culture by streamlining and enhancing tools like the CFTC intranet and collaboration portals to enhance the exchange of knowledge. An enterprise data and technology environment that is highly available, scalable, secure, and up-to-date will support an increasingly mobile staff and assured continuity of operations. Regulatory and mission support data will be increasingly harmonized and systems and platforms will be increasingly integrated to meet both Commission-wide and program-specific needs without redundancy. Expanding the use of CFTC collaboration platforms and internal social media tools will provide staff with opportunities to become more engaged in Commission-wide activities. Providing learning management and video production services – to improve the overall knowledge and proficiency of CFTC staff and provide organizational flexibility. Improving desktop, mobile, and video-conferencing technology and staff awareness of capabilities will increase productivity, satisfaction with the workplace environment, and compliance with approved access methods. Continuing centralization of management and administrative data and systems services like Unified Reporting will increase use of government-wide shared services. Enhancing data management tools, procedures, and infrastructure will support Commission-wide data environments and increase efficiency and appropriate Commission-wide reuse of data. Automating security control, data loss prevention, and identity management tools and implementing continuous monitoring will improve internal controls and reduce information security risk. Fully deploying an electronic records and document management system will improve information management and security, support process automation, improve internal controls, and improve staff productivity. Maintaining IT services and IT infrastructure so that it is always available to staff and continues to work efficiently when the Commission increases staff and when staff increases their use of technology to conduct market oversight activities. Other Information presents key information regarding the CFTC FY 2014 – FY 2018 Strategic Plan. See below for details on the various sections. Information technology (IT) is a critical component of the CFTC’s ability to effectively and efficiently meet its mission. An IT Strategic Plan comprehensively looks at “where,” “how,” and “when” information technology will work with staff and contractors to enable the CFTC to best achieve its goals and its objectives. Below are the 2014-2018 Information Technology Strategic Plan goals. A key driver of the information technology program is the delivery of technology platforms, systems, and services to support CFTC mission and support functions. It is a priority to meet business needs first by empowering users with self-service technology platforms for data analysis, then by enterprise-focused automation services. Accordingly, the self-service technology platforms, including business intelligence software and collaboration software, empower CFTC staff to quickly and iteratively develop analytical work products (e.g., surveillance reports) and share information without being hampered by a dependence on technologists to build solutions. If requirements are such that self-service is not practical and packaged solutions are available in the market, then CFTC will buy, configure, and integrate the appropriate solutions to meet the business need. Given the unique nature of CFTC requirements, if a solution is not available in the marketplace then many of the same technology platforms mentioned previously are leveraged to build custom mission systems. The CFTC increasingly and unavoidably relies on its understanding of data to ensure that it can perform its regulatory and public policy functions effectively. As the markets and participants it oversees overwhelmingly turn electronic, engage in faster and more automated trading, and transact in products that are more and more complex, the CFTC increasingly needs to be a regulator that understands, aggregates, processes, summarizes, and acts on data in a timely manner for surveillance, enforcement and transparency reporting. The markets and participants that CFTC regulates generate and report to the CFTC a large quantity of information from multiple industry sources across multiple markets. Increasing speed, volume, and complexity in these products and markets require the CFTC to develop an increasingly sophisticated ability to validate and pre-digest the reported data so that front-line regulatory functions such as surveillance and enforcement can more effectively use that data. In addition, since the CFTC’s regulatory regime has expanded to include swaps, it needs to ensure that the integration of swaps oversight into existing program initiatives includes upgrades to keep up with new techniques and technologies. Thus, data management is essential to all of the CFTC’s regulatory initiatives, particularly as swaps oversight is integrated into existing program initiatives. As the scope of CFTC oversight increases and expands and as the markets and related data grow increasingly complex, the Commission must continue to provide a stable, scalable and secure IT infrastructure to meet demand. The CFTC’s IT infrastructure is the combination of hardware, software, network resources, facilities, and services that are common across the CFTC regardless of mission, program, or project and are the foundation of the CFTC’s IT environment. This infrastructure supports the development, testing, delivery, monitoring, control, and support of IT resources. To continue supporting improved business outcomes IT management processes will continue to be integrated into the CFTC’s planning and governance processes. The degree to which IT management leverages best practices, CFTC processes, and proven tools to achieve efficiency of operations will help define its success in fully supporting the CFTC’s regulatory mission and mission support activities. That the cases the CFTC prosecutes and the work the CFTC accomplishes be grounded in adequate legal sufficiency is of the utmost importance in executing its mission and ensuring the public’s trust. The CFTC has a duty, with a corresponding standard of conduct, to measure legal sufficiency in terms of the sufficiency of the proof supporting its actions and the reasonableness of its decisions about law and fact. The CFTC has several mechanisms in place to ensure legal sufficiency. As the CFTC’s statutory legal advisor, the General Counsel (GC) ensures that the Commission speaks with one voice in interpreting and applying the CEA. GC staff serves as strategic partners with CFTC divisions and leadership and enable the Commission to fulfill its mission while at the same time assuring the legal sufficiency of the Commission’s performance under personnel laws, procurement law, rules governing records maintenance and disposition, and other applicable laws. In addition to the General Counsel, the CFTC embeds lawyers in each Division and Office to provide sound legal counsel. The Office of Proceedings, within the Executive Director’s office, provides a forum for administrative enforcement actions. If an administrative enforcement action requires an administrative law judge, the Office of Proceedings can obtain a senior or borrowed judge utilizing the services of the Office of Personnel Management. Reviewing proposed and final rulemakings, enforcement actions and regulatory initiatives for consistency with the CEA, Commission rules, and relevant precedent. Assuring that proposed Commission actions comply with any other applicable statutes, including the Administrative Procedure Act. Assisting the Commission in analyzing legislation and preparing technical assistance to Congress, as well as providing legal counsel in support of the Commission’s bilateral and multi-agency initiatives with other regulatory authorities. Representing the Commission before U.S. courts of appeals, U.S. district courts and other administrative bodies in proceedings that involve challenges to the Commission’s regulations, appeals in enforcement actions, other cases that present questions falling within the scope of the CEA, and employment matters. Monitoring bankruptcy proceedings involving derivatives industry participants and assisting courts in interpreting and applying the commodity broker liquidation provisions of the U.S. Bankruptcy Code. Advising the Commission in resolving appeals from decisions of industry SROs and decisions of the Commission’s presiding officers in administrative cases. Assisting the Commission in interpreting and applying the requirements of a variety of government-wide statutes, such as the Federal Advisory Committee Act, the Federal Information Security Management Act, and the Freedom of Information Act. Drafting and reviewing domestic and international memoranda of understanding and other agreements as appropriate to further the work of the Commission and assure that Commission data is protected and agreements are consistent with the CEA. Reviewing compliance with ethical standards applicable to the Commission and its staff. The conduct of cost-benefit and other analysis of new rules to ensure that they are economically sound. New and existing regulations are evaluated in light of considerations of, among other factors, protection of market participants and the public, efficiency and competitiveness of futures markets, price discovery, and sound risk management practices. Economic collaboration across the Divisions and Offices of the Commission. The extensive research and analytical backgrounds of senior economists ensures that analyses reflect the forefront of economic knowledge and econometric techniques. Engagement with the broader economic and financial research community. Staff present research findings at academic and industry conferences; the analysis thus benefits from comments and insights of leading researchers not affiliated with the Commission. Such long-term research projects often result in high-quality research published in peer-reviewed journals. These publications provide transparency into the functioning of financial markets and also place the CFTC’s research findings into the context of the broad academic and practitioner literature, validating its scientific merit. The conduct of Commission-directed studies and initiatives, such as the Swaps Report and other Commission transparency initiatives. Staff expertise is grounded in a solid knowledge of market institutions and practices and experience communicating the results of quantitative analysis. These skills provide direction in effective communication of market information. The CFTC met with staff of the House Committee on Agriculture on February 20, 2013 and the Senate Committee on Agriculture Nutrition and Forestry on September 26, 2013 to discuss the CFTC’s strategic plan. House Agriculture Committee staff suggested that the CFTC avoid using absolutisms when developing strategic goals and objectives. The specific example provided dealt with the concept of “preventing” systemic risk. Regardless of the amount of government oversight provided, preventing systemic risk is not a possible goal. The strategic plan now states the goal as the “avoidance of” systemic risk. Senate Agriculture, Nutrition and Forestry Committee staff reinforced the mission, goals, and strategies the CFTC plans to pursue and stressed the importance of performance goals in measuring progress. While many of the performance goals are new in the strategic plan and require baselines before annual targets can be set, Senate staff suggested careful review of historical data to assist or accelerate the baselining process. Where possible, the CFTC will implement this recommendation. Key staff:  In compliance with the GPRAMA, the CFTC appointed a Chief Operating Officer and a Performance Improvement Officer. These senior level positions are designed to manage and improve the overall performance of the Commission. In addition, CFTC dedicated staff to monitor performance goals and indicators and build the Annual Performance Report and quarterly updates. 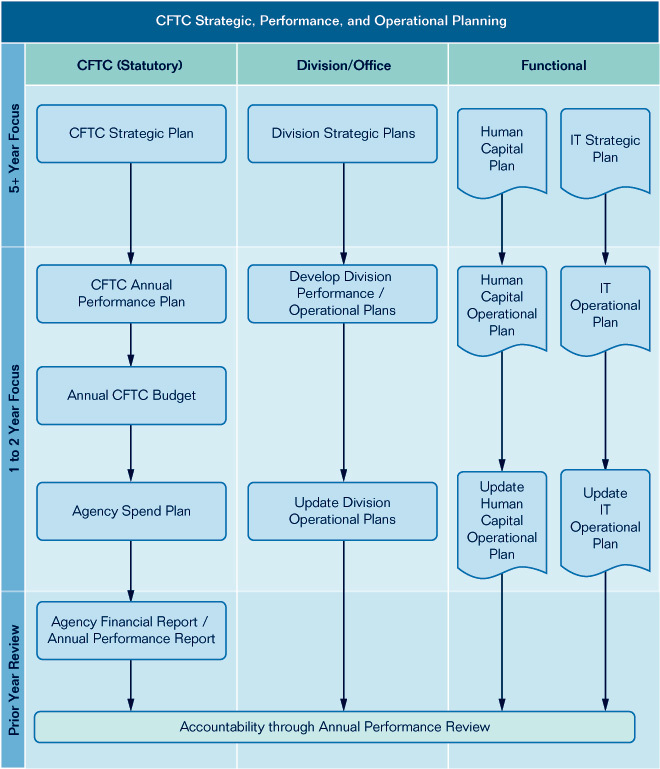 February-May:  Develop the CFTC Annual Performance/Operational Plan. June-September:  Build the CFTC Budget Request based on the Performance/Operational Plan. October-January:  Develop the Annual Performance Report to assess performance in the prior fiscal year. February:  Submit to Congress the Annual Performance Plan/Report/President’s Budget. October (or when appropriated): Prepare and submit an updated Operational/Spend plan to Congress. To ensure Commission accountability in producing and approving operational plans, the CFTC developed Management Objective 5.1.a. Each of these activities is described in the CFTC Planning Manual which is currently being updated and depicted in a high-level graphic on the following page. The CFTC tracks the status of each of these products in a cross-functional planning schedule that is updated quarterly for the Executive Director. The CFTC ensures that significant Commission budgets, reports, and plans are properly acknowledged, linked, and executed. Governance:  Strong governance is a key ingredient to Planning and Execution in that it fosters transparency, communication, and a corporate “one voice” mentality. 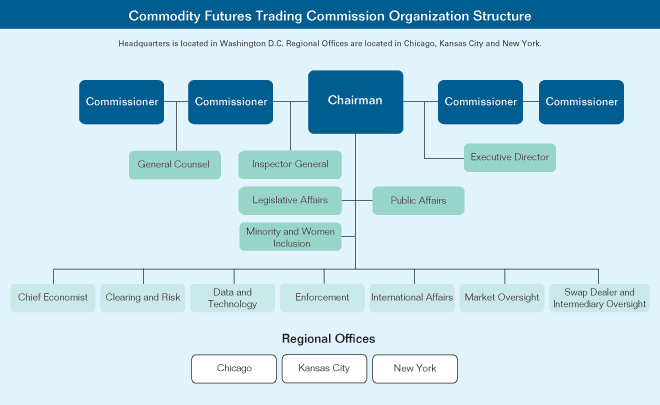 In 2013, the CFTC created a Resource Governance Board that consists of Division Business Managers and key functional staff including the Chief Financial Officer, Chief Human Capital Officer, and Chief Planning Officer. This group meets weekly to discuss current planning, budgeting, and resource issues. Program Analysis and Evaluation:  This newly formalized effort of Program Analysis and Evaluation aims to improve the decision making process in the Commission by improving business case analysis and decision support; assisting project managers with objective, unbiased analysis; and providing post implementation evaluation to garner lessons learned for future project managers. The following are the Cross-Agency Priority (CAP) goals required by GPRAMA of 2010 and published on OMB’s Performance.gov webpage. Exports – Double U.S. exports by the end of 2014. Entrepreneurship and Small Business – Increase federal services to entrepreneurs and small businesses with an emphasis on (1) startups and growing firms and (2) underserved markets. Broadband – As part of expanding all broadband capabilities, ensure 4G wireless broadband coverage for 98 percent of Americans by 2016. Energy Efficiency – Reduce Energy Intensity (energy demand/$ real GDP) 50 percent by 2035 (2010 as base year). Veteran Career Readiness – Improve career readiness of veterans. By September 30, 2013, increase the percent of eligible service members who will be served by career readiness and preparedness programs from 50 percent to 90 percent in order to improve their competitiveness in the job market. Science, Technology, Engineering, and Math – In support of the President’s goal that the United States have the highest proportion of college graduates in the world by 2020, the Federal Government will work with education partners to improve the quality of science, technology, engineering and math (STEM) education at all levels to help increase the number of well-prepared graduates with STEM degrees by one-third over the next 10 years, resulting in an additional 1 million graduates with degrees in STEM subjects. Job Training – Ensure our country has one of the most skilled workforces in the world by preparing 2 million workers with skills training by 2015 and improving the coordination and delivery of job training services. Cyber security – Executive branch departments and agencies will achieve 95% implementation of the Administration’s priority cybersecurity capabilities by the end of FY 2014. These capabilities include strong authentication, Trusted Internet Connections (TIC), and Continuous Monitoring. Sustainability – By 2020, the federal government will reduce its direct greenhouse gas emissions by 28 percent and will reduce its indirect greenhouse gas emissions by 13 percent by 2020 (from 2008 baseline). Real Property – The federal Government will maintain the FY 2012 square footage baseline of its office and warehouse inventory. Improper Payments – The federal government will achieve a payment accuracy rate of 97 percent by the end of 2016. Data Center Consolidation – Improve IT service delivery, reduce waste and save $3 billion in taxpayer dollars by closing at least 1200 data centers by fiscal year 2015. Closing the Skills Gap – Close critical skills gaps in the federal workforce to improve mission performance. By September 30, 2013, close the skills gaps by 50 percent for 3 to 5 critical federal government occupations or competencies, and close additional agency-specific high risk occupation and competency gaps. Strategic Sourcing – Reduce the costs of acquiring common products and services by agencies’ strategic sourcing of at least two new commodities or services in both 2013 and 2014 that yield at least a 10 percent savings. The CFTC’s Management Objectives contribute directly to several of these CAP goals. For example Management Objective 5.1 (a high-performing, diverse, and engaged workforce), focuses the CAP goals of Job Training and Closing the Skill Gap goals. The Commission is closing skills gaps, for three critical occupations – Economist, Investigators and Attorney Advisors. The Commission developed and deployed a customized training and development needs assessment tool and hosted over 15 courses related to the oversights of swaps and the Commission will deploy in the near-term, a CFTC School of Swaps. Behavior competencies, particularly those associated with supervisory responsibilities are being addressed through formal supervisory training and focused in-classroom courses that deal with situational leadership, and managing crucial conversations. Executive Development is both a near and long-term focus of the Commission. The Commission has begun creating Executive Development Plans for all senior leaders. Those plans include participation in a core curriculum that will build trust, encourage high performing teams, and give Executives the skills needed to lead through change. The other Management Objective, effective stewardship of resources, addresses several CAP goals including energy efficiency, real property, strategic sourcing, and sustainability. The Commission is dedicated to reducing its energy footprint and is implementing several initiatives with this goal. To reduce heating and air conditioning consumptions, HVAC was programmed to shut off at the close of business each day, and only remained operating in off-hours for critical or mission support purposes. The “lights out” program uses motion sensors to monitor activity in each office and turn off the light when the office is inactive for a specified period of time. Periodic nighttime surveys (after cleaning crew and security have departed) are used to monitor success. The CFTC reduced contracting costs more than 10% by use of blanket purchase agreements. Examples include blanket purchase agreements for HR support services, web consulting services, IT services, and mobile devices. The CFTC plans to transition to a virtual desktop environment that will reduce end point power consumption requirements, in addition to providing better mobile access and telework functionality, reducing ongoing operational support costs, and providing more flexibility in meeting fluctuating staffing levels. The CFTC strives to use commercially-provided Infrastructure-as-a-Service (IaaS) for the Commission’s storage area networks (SANs), virtualized servers, and high-performance computing environment to eliminate the need for a dedicated Data Center facility. Complete implementation of 2-factor authentication to CFTC systems for all modes of access (mobile device, BYOD, telework, desktop, external participant). Implement a Mobile Device Management (MDM) System to ensure all data is securely controlled and managed to protect the CFTC from unauthorized access. Initiate a Data Loss Prevention (DLP) program to reduce the risk of staff inadvertently disclosing sensitive information. Develop a security operations center (SOC) to increase situational awareness and prevent and react rapidly to information security incidents. Legislation could be enacted that adds to or reduces CFTC’s scope of regulation or ability to access critical information. Appropriations may be above or below the level requested. World and U.S. economies could grow or contract dramatically. Demand for or supply of commodities and other goods and services that affect commodity markets and derivatives trading could change significantly. Court decisions may alter prior understandings on which the Commission based workload projections, business processes or resource requirements. Information Technology capabilities could materially change, improving or hindering the Commission’s ability to monitor market or participant behavior or analyze transactions. New derivative products, processes or market participants may develop, having a positive or negative effect in the Commission’s ability to oversee the market. War or terrorist activity could disrupt the Commission’s ability to fulfill its responsibilities. Critical staff with hard to replace competencies could leave or be unable to work for some period of time. The Offices of the Chairman and the Commissioners provide executive direction and leadership to the Commission. The Office of the Chairman includes Public Affairs and Legislative Affairs. The OGC provides legal services and support to the Commission and all of its programs. These activities primarily include: (1) providing advice on complex questions of statutory and regulatory interpretation arising under the CEA; (2) representing the Commission in U.S. Courts of Appeals, amicus curiae litigation, industry bankruptcies, defense of rule challenges, and other litigation; (3) providing legal support and advice in connection with other relevant Federal statutes; (4) assisting the Commission in the performance of its adjudicatory functions; and (5) providing advice on legislative and other intergovernmental issues. The OIG is an independent organizational unit at the CFTC. The mission of the OIG is to detect waste, fraud, and abuse and to promote integrity, economy, efficiency, and effectiveness in the CFTC’s programs and operations. As such it has the ability to review all of the Commission’s programs, activities, and records. In accordance with the Inspector General Act of 1978, as amended, the OIG issues semiannual reports detailing its activities, findings, and recommendations. The Commission’s ability to achieve its mission of protecting the public, derivative market participants, U.S. economy, and the U.S. position in global markets is driven by well-informed and reasoned executive direction; strong and focused management; and an efficiently-resourced, dedicated, and productive workforce. These attributes of an effective organization combine to lead and support the critical work of the Commission to provide sound regulatory oversight and enforcement programs for the U.S. public. 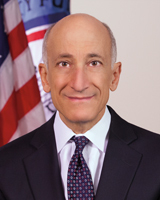 The Executive Director ensures the Commission’s continued success, continuity of operations, and adaptation to the ever-changing markets it is charged with regulating; directs the effective and efficient allocation of CFTC resources; develops and implements management and administrative policy; and ensures program performance is measured and tracked Commission-wide. The OED includes the following programs: Business Management and Planning, Library, Records and Privacy, Financial Management, Human Resources, Secretariat, Diversity and Inclusion, Consumer Outreach, and the Office of Proceedings. The Office of Proceedings has a dual function to provide a cost-effective, impartial, and expeditious forum for handling customer complaints against persons or firms registered under the CEA and to administer enforcement actions, including statutory disqualifications, and wage garnishment cases. The OCO administers the Commission’s consumer anti-fraud and other public education initiatives. The OCE provides economic analysis and advice to the Commission, conducts research on policy issues facing the Commission, and educates and trains Commission staff. The OCE plays an integral role in the implementation of new financial market regulations by providing economic expertise and cost-benefit considerations underlying those regulations. The DCR supervises the derivatives clearing organizations (DCOs) that clear futures, options on futures, and swaps, which involves supervision of DCOs and surveillance of other market participants that may pose risk to the clearing process including futures commission merchants (FCMs), SDs, major swap participants (MSPs), and large traders. The DCR staff: (1) prepare proposed and final regulations, orders, guidelines, exemptions, interpretations, and other regulatory work products on issues pertaining to DCOs and, as relevant, other market participants; (2) review DCO applications and rule submissions and make recommendations to the Commission; (3) make determinations and recommendations to the Commission as to categories of swaps that should be subject to mandatory clearing determinations; (4) make determinations and recommendations to the Commission as to the initial eligibility or continuing qualification of a DCO to clear swaps; (5) assess compliance by DCOs with the CEA and Commission regulations, including examining systemically important DCOs at least once a year; (6) conduct risk assessment and financial surveillance through the use of risk assessment tools, including automated systems to gather and analyze financial information, and to identify, quantify, monitor the risks posed by DCOs, clearing members, and market participants and its financial impact, evaluate new DCO margin models and enhancements to existing margin models; (7) review DCO notifications regarding systems disruptions, material planned changes to mission-critical systems or programs of risk analysis and any other notifications that potentially impact the DCOs’ ability to process, clear and risk manage its business activities; and (8) working with the OIA, participate in the work of international regulators in setting world-wide standards with respect to Central Counterparties (CCPs) and their members, and in evaluating the application of those standards. The ODT is led by the Chief Information Officer and delivers services to CFTC through three components: 1) systems and services, 2) data management, and 3) infrastructure and operations. Systems and services focuses on several areas: market and financial oversight and surveillance; enforcement and legal support; document, records, and knowledge management; CFTC-wide enterprise services; and management and administration. Systems and services provide access to data and information, platforms for data analysis, and enterprise-focused automation services. Data management focuses on data analysis activities that support data acquisition, utilization, management, reuse, transparency reporting, and data operations support. Data management provides a standards-based, flexible data architecture; guidance to the industry on data reporting and recordkeeping; reference data that is correct; and market data that can be efficiently aggregated and correlated by staff. Infrastructure and operations organizes delivery of services around network infrastructure and operations, telecommunications, and desktop and customer services. Delivered services are widely available, flexible, reliable, and scalable, supporting the systems and platforms that empower staff to fulfill the CFTC mission. The three service delivery components are unified by an enterprise-wide approach that is driven by the Commission’s strategic goals and objectives and incorporates information security, enterprise architecture, and project management. The DOE investigates and prosecutes alleged violations of the CEA, the Dodd-Frank Act, and Commission regulations. Possible violations involve improper conduct related to commodity derivatives trading on U.S. exchanges, or the improper marketing and sales of commodity derivatives products to the general public. The WBO, a component of the DOE, performs the ministerial functions and determination of preliminary award eligibility and guides the handling of whistleblower matters as needed during examination, investigation and litigation. The OIA advises the Commission regarding international regulatory initiatives; provides guidance regarding international issues raised in Commission matters; represents the Commission in international organizations, such as International Organization of Securities Commissions (IOSCO); coordinates Commission policy as it relates to policies and initiatives of major foreign jurisdictions, the G20, Financial Stability Board and the U.S. Department of the Treasury (Treasury); and provides technical assistance to foreign market authorities. The DMO fosters markets that accurately reflect the forces of supply and demand for the underlying commodities and are free of disruptive activity. To achieve this goal, staff oversee trade execution facilities, perform market and trade practice surveillance, review new exchange applications and examine existing exchanges to ensure their compliance with the applicable core principles. Other important work includes evaluating new products to ensure they are not susceptible to manipulation, and reviewing exchange rules and actions to ensure compliance with the CEA and CFTC regulations. The DSIO oversees the registration and compliance activities of intermediaries and the futures industry self-regulatory organizations (SROs), which include the U.S. derivatives exchanges and the National Futures Association (NFA). Staff develop and implement regulations concerning registration, fitness, financial adequacy, sales practices, protection of customer funds, cross-border transactions, and anti-money laundering programs, as well as policies for coordination with foreign market authorities and emergency procedures to address market-related events that impact intermediaries. DSIO monitors the compliance activities of these registrants and provides oversight and guidance for complying with the system of registration and compliance established by the CEA and the Commission’s regulations. Concurrently, DSIO evaluates the effectiveness of registrant governance and internal oversight through targeted reviews and examinations, oversight of examinations performed by SROs and a focus on the activities of the risk managers and chief compliance officers. DSIO also reviews whether registrants maintain sufficient financial resources, risk management procedures, internal controls and customer protection practices to enhance the financial stability of market participants and transparency in the markets. The CFTC Strategic Plan was produced by the contributions of decided and talented Commission staff. Accordingly, the Business Management and Planning Branch would like to offer a genuine thank you and offer our appreciation for their effort.